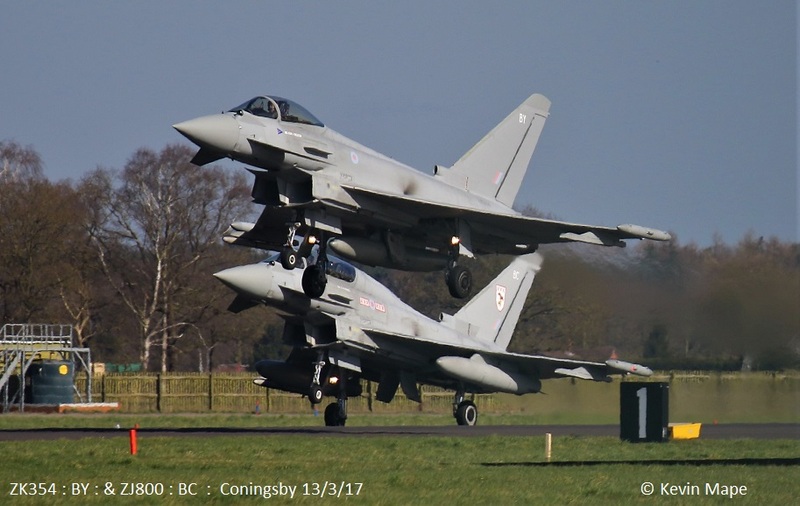 RAF Coningsby March 2017 movements. 1st Wed Log thanks to Garf . No.103/YT/EAT00.319/Xingu c/s “Cotam 1729” – Departed. 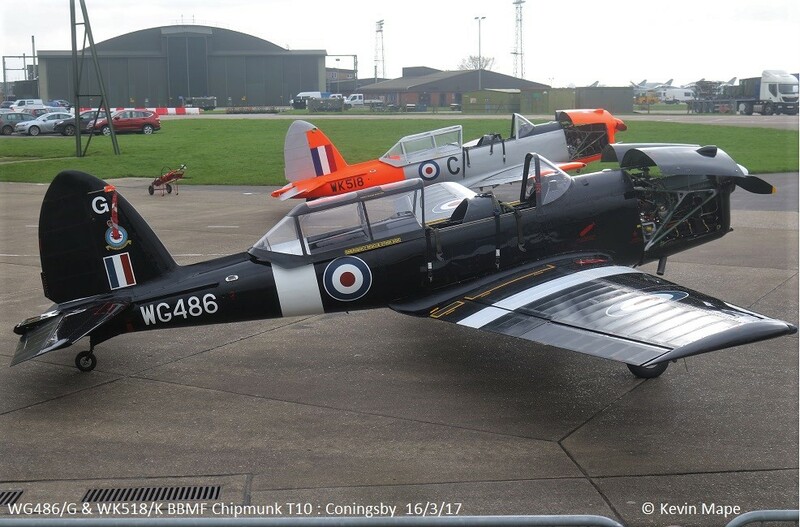 WG486/G/BBMF/Chipmunk T10 c/s “Chippy 96” – To Biggin Hill – Crew ferry for MK356. 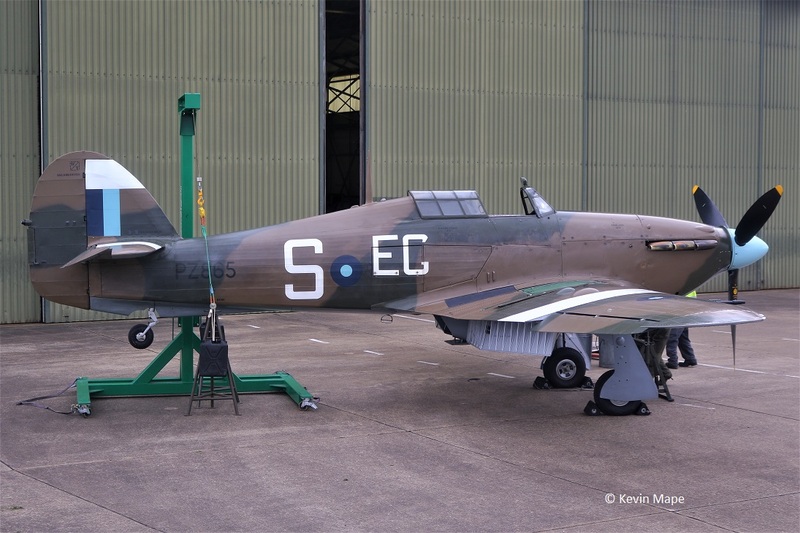 MK356/5J-K/BBMF/Spitfire LF IXe c/s “Spitfire 90” – To Biggin Hill for Overhaul. 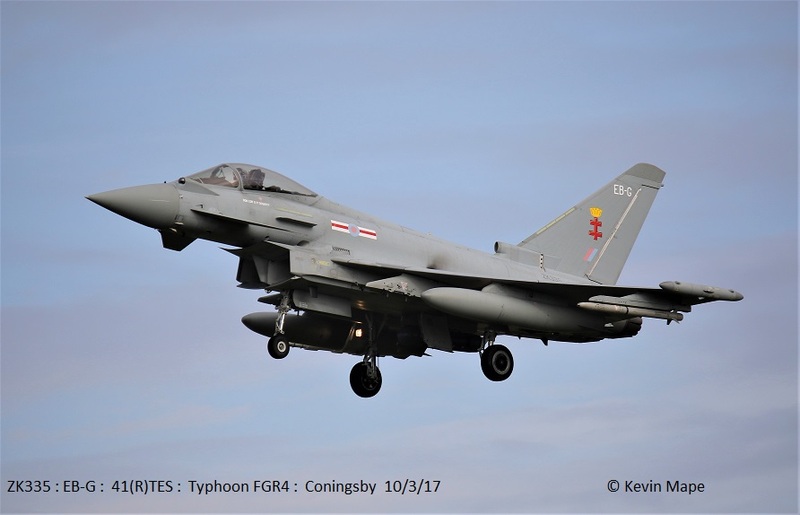 G-MAJC/JC/Eastern/Jetstream 41 c/s “East Flt 104” in “106” – out..
3(F)Sqn – ZK325/325 code only, ZJ928/FQ/1(F)Sqn. 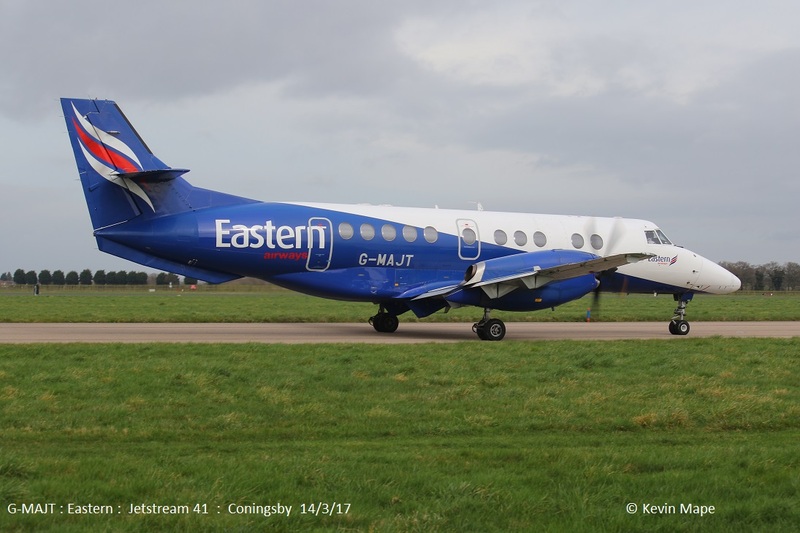 G-MAJC/JC/Eastern/Jetstream 41 c/s “East Flt 103” in “104” – out. 6th Mon Log thanks to Susie,Mark & Gaz. 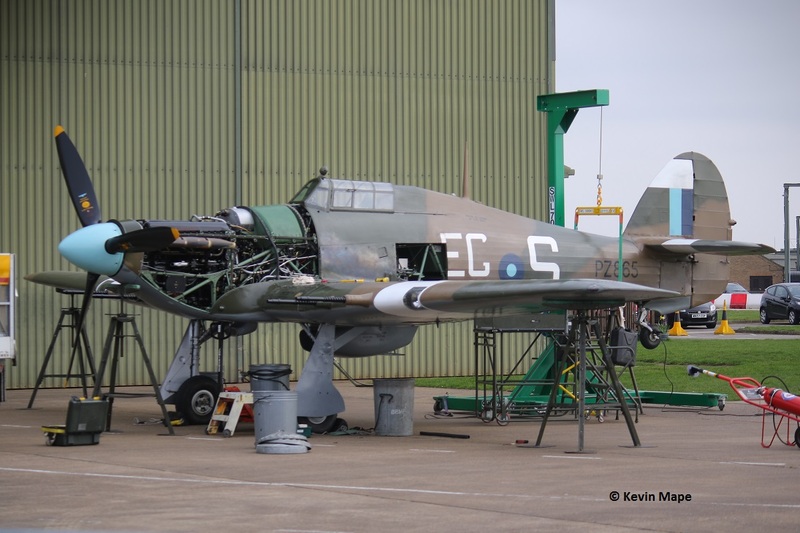 ZK301/EW towed into paint shop minus Engines, Rudder Flaps. ZJ946 – Towed to TMF – Minus paint. 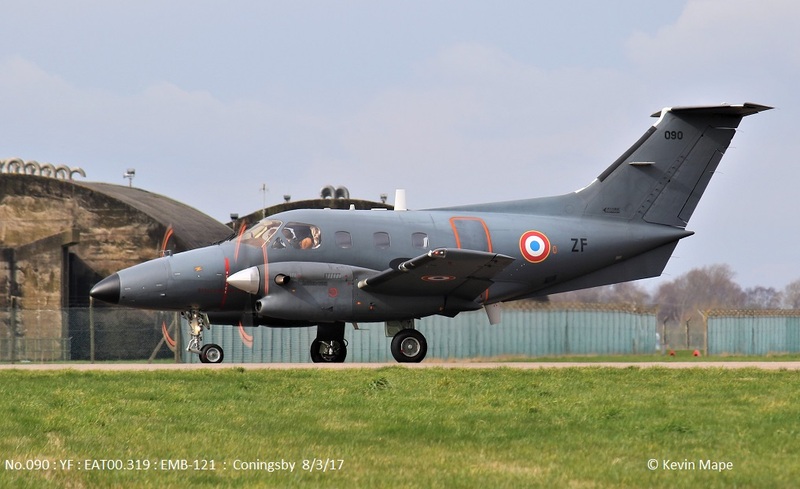 ZJ942/DH/XI(F)Sqn c/s “Alpha 6 Papa 41” – QRA to intercept of Polish Saab 340 into Birmingham. ZJ946/ Paint removed – noted outside TMF. G-MAJC/JC/Eastern/Jetstream c/s “East Flt 102” in, “103” out. 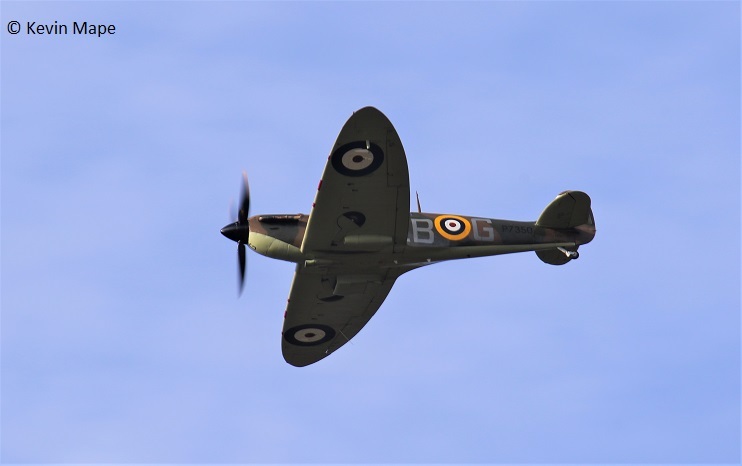 P7350/EB-G/BBMF/Spitfire IIa c/s “Spitfire 90” – 1st flight of the year. G-MAJC/JC/Eastern/Jetstream 41 c/s “East Flt 104” in, “105” out. 11-0057/352 SoW/CV-22B c/s “Knife 72” – Overfly 19-09pm. 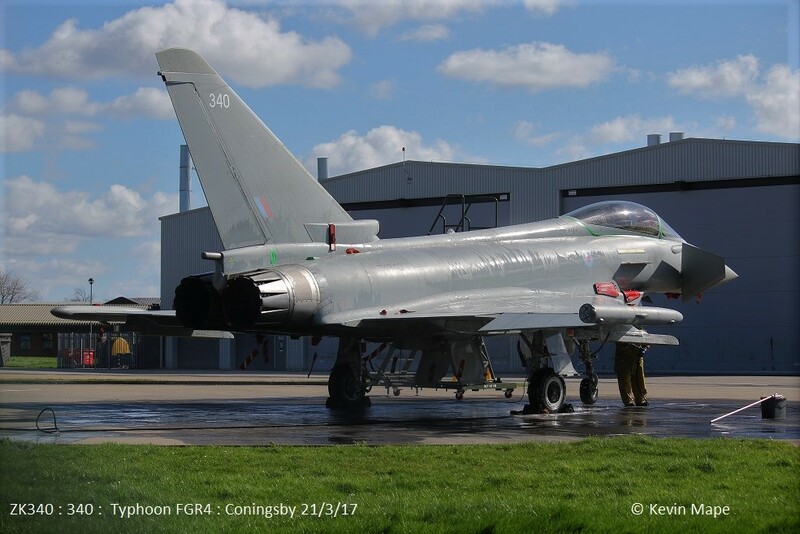 ZK346/ER – Towed out of HAS5 – Engine run – then put back into HAS5. AM – Log thanks to Lou Barwell. G-MAJD/JD/Eastern/Jetstream c/s “East Flt 102” in, “103” out. No.090/YF/EAT00.319/Xingu c/s “Cotam 1776” – Parked on Sierra. No.099/YP/EAT00.319/Xingu c/s “Cotam 1757” – Parked on Sierra. 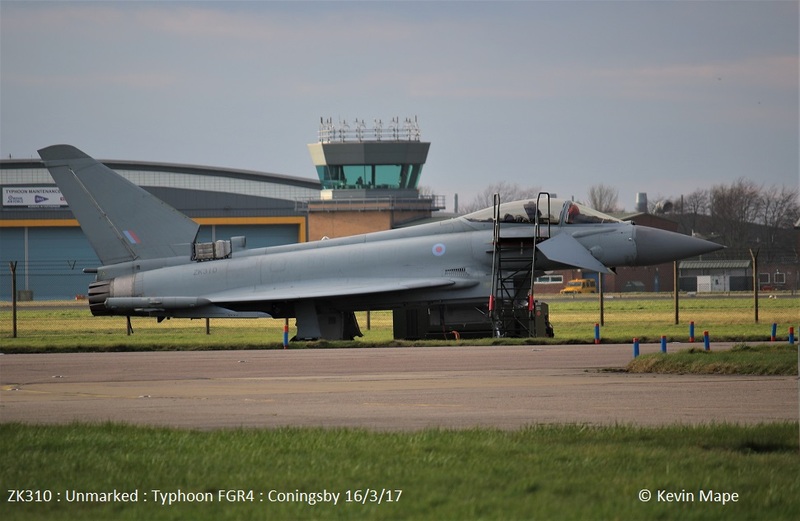 ZJ804/BM/29(R)Sqn c/s “Typhoon 25” – Display – aborted. No.090/YF/EAT00.319/Xingu c/s “Cotam 1776” – Departed. G-MAJD/JD/Eastern/Jetstream c/s “East Flt 104” in, “105” out. 9th Thur Log thanks to Susie . 08-0050/352SOW/ CV-22B Osprey c/s Knife 71 – high overfly. 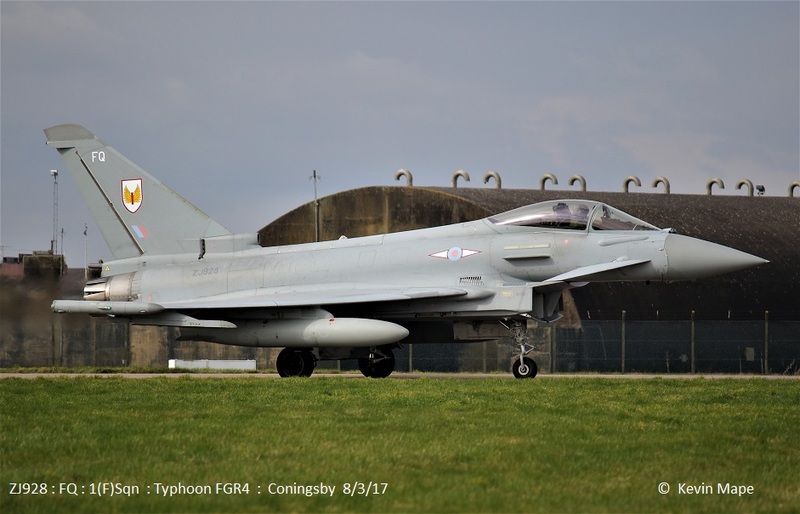 ZJ804/BM/29(R)Sqn c/s “Typhoon 29” – Display. “Zenith 11” – ground abort. ZJ800/BC/29(R)Sqn c/s Cobra 52 (believe smoke) pilot jumped out emergency arrived. 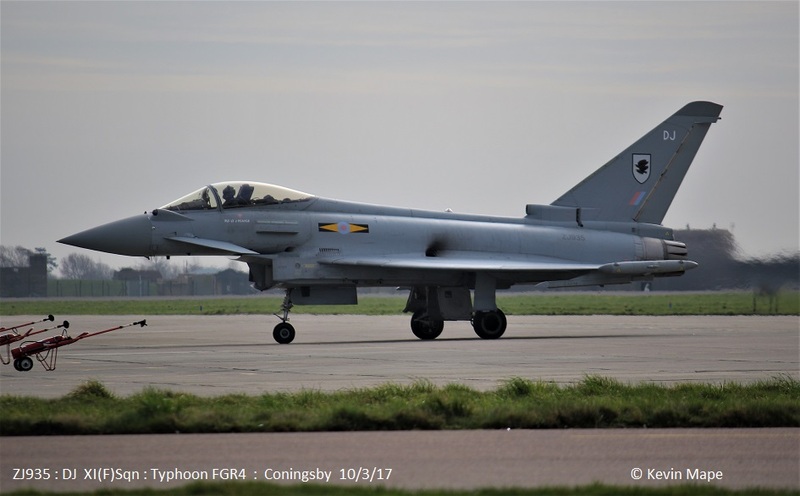 ZJ806/BE/29(R)Sqn c/s “Typhoon 09” – Took the RHAG on return. 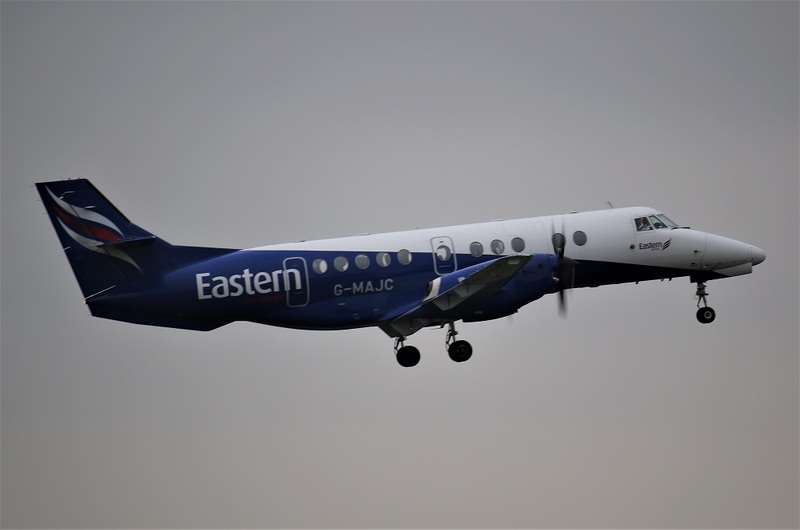 G-MAJD/JD/Eastern/Jetstream c/s East Flt 104 in 105 out. 10th Fri Log thanks to Susie & Tina. 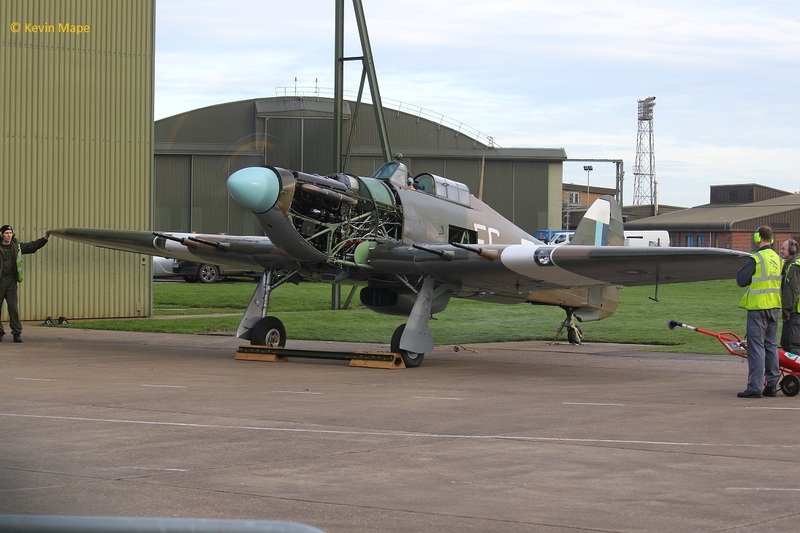 WK518/C/BBMF/Chipmunk T10 – Engine runs. ZK365/EB-L/41(R)TES c/s “Apollo 12” – ground abort. 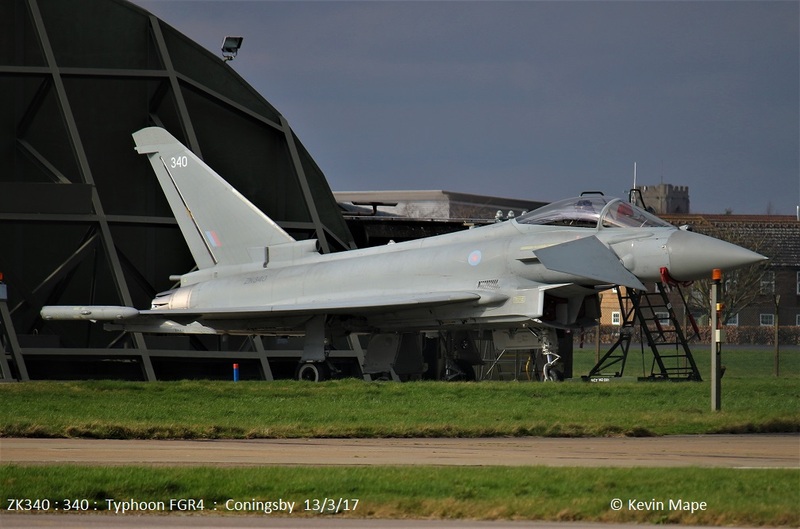 ZJ935/DJ/XI(F)Sqn c/s “Lossie 97” – Parked on the ASP. 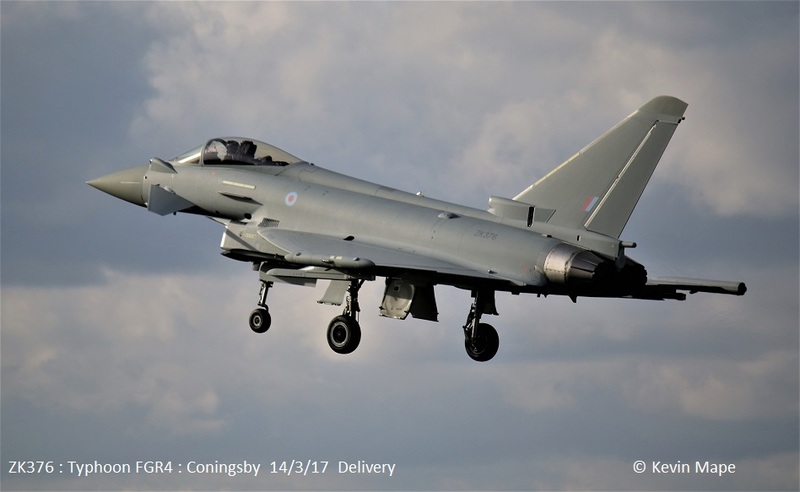 ZK317/317 code only c/s “Lossie 97” – Delivery ex TMF to Lossiemouth. ZJ228/3Reg/Apache AH1 c/s “Gunship 3” – Low overfly. 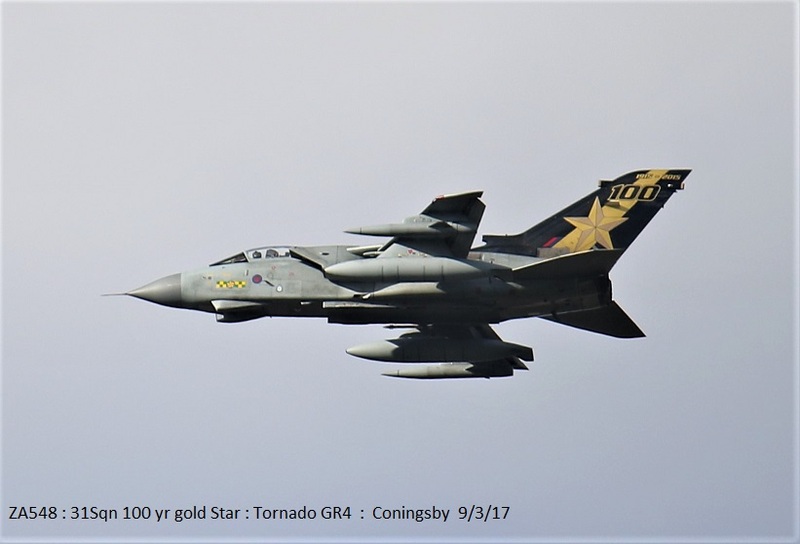 ZM407/407/70Sqn c/s “Comet 85” – Overshoots. 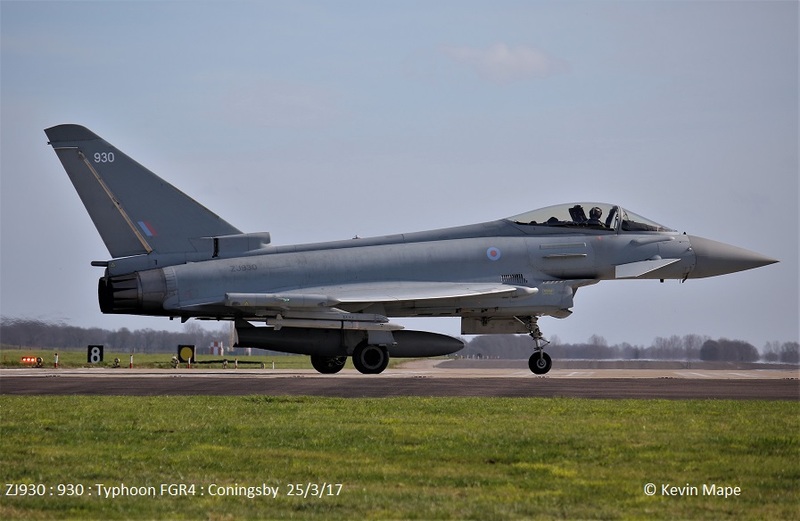 ZJ917/DG/XI(F)Sqn c/s 0HY26″ – QRA stand by . 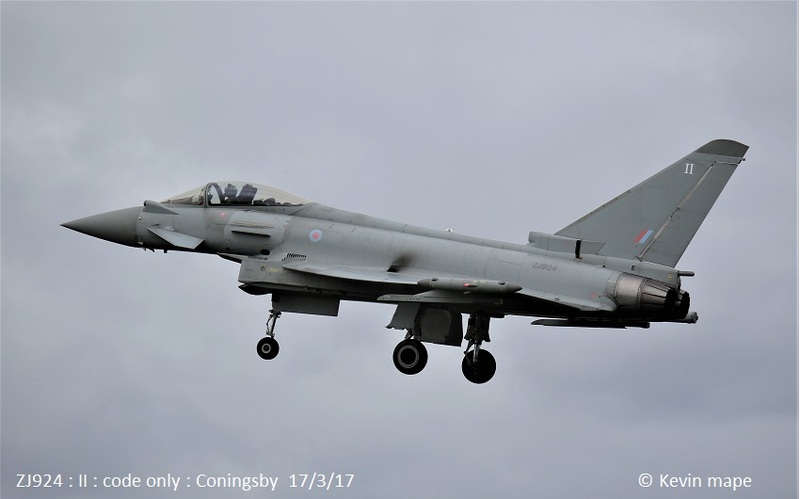 ZJ923/Unmarked c/s 0HY27″ – QRA stand by . 13th Mon Log thanks to Steve,Val & Susie. 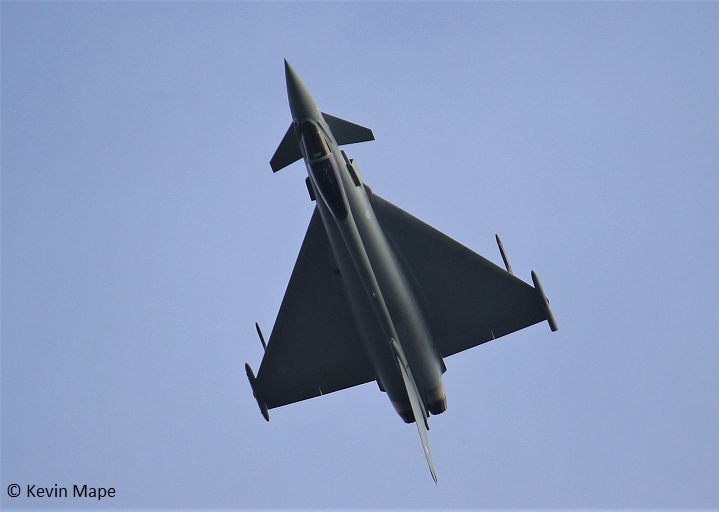 FB22/2 Wing / F-16BM c/s “Belgium Air Force 281” – Overshoot – From Holbeach Range. 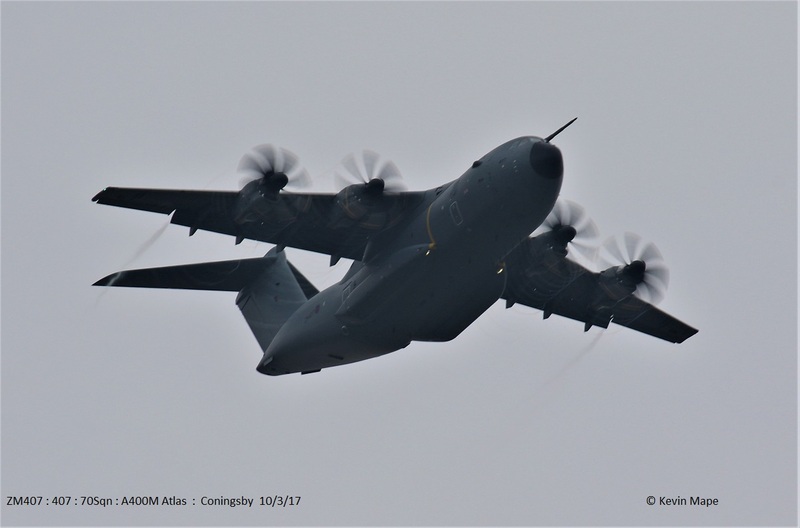 12-5757/7SOS/MC-130J c/s “Strix 20” – overfly. ZJ923/Unmarked towed from HAS 3 to HAS 1 in QRA fit. ZK310/FL code only – Noted on the Wash pan. 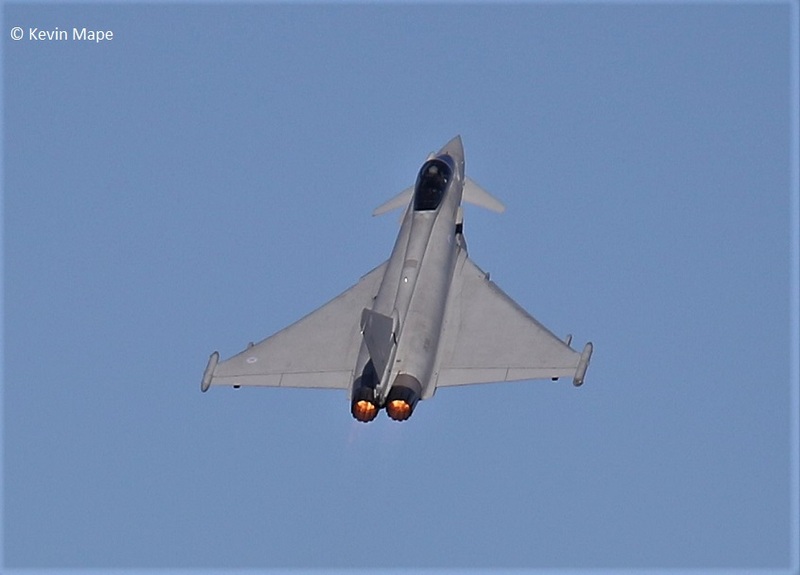 ZJ917/DG/XI(F)Sqn – Towed from HAS 2 to HAS 3 – QRA Duty. ZK310/FL code only – Towed from Wash pan to Echo. G-MAJT/JT/Eastern/Jetstream 41 c/s “East flt 104” in “105” out. 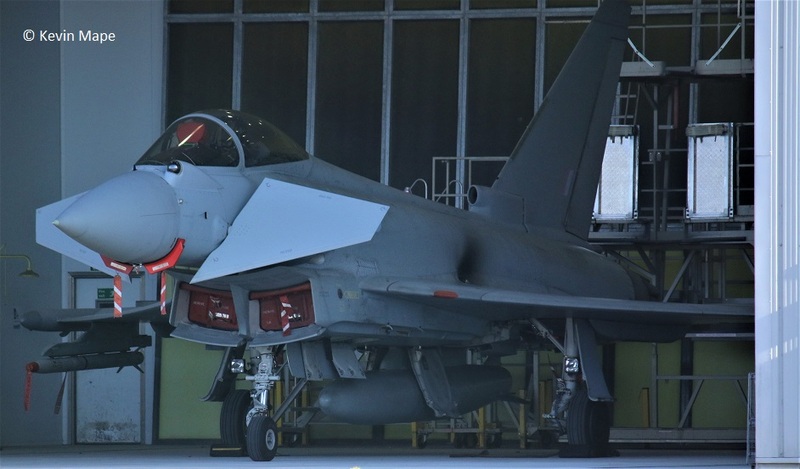 ZJ929/DL/XI(F)Sqn – Towed from HAS 1 to HAS 2 – QRA duty. ZA720/Chinook HC4 c/s “Vortex 596” overfly – heading south. (TMF) – ZK368/368 – F/N with code. G-MAJT/JT/Eastern/Jetstream 41 c/s “East flt 102” in “103” out. 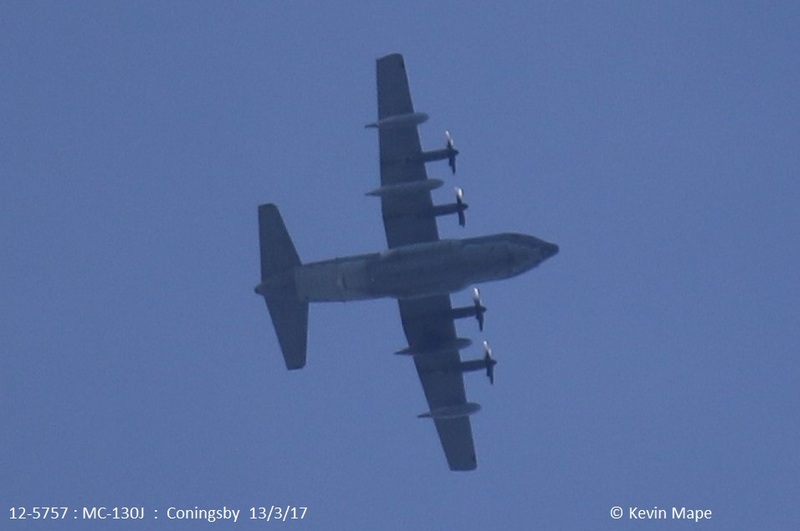 ZH875/Hercules C4 c/s “Ascot 268” – Overfly ( green marks) north to south. “Triplex 31/32” – ground abort. ZK305/EE code only – Noted on the Wash pan. 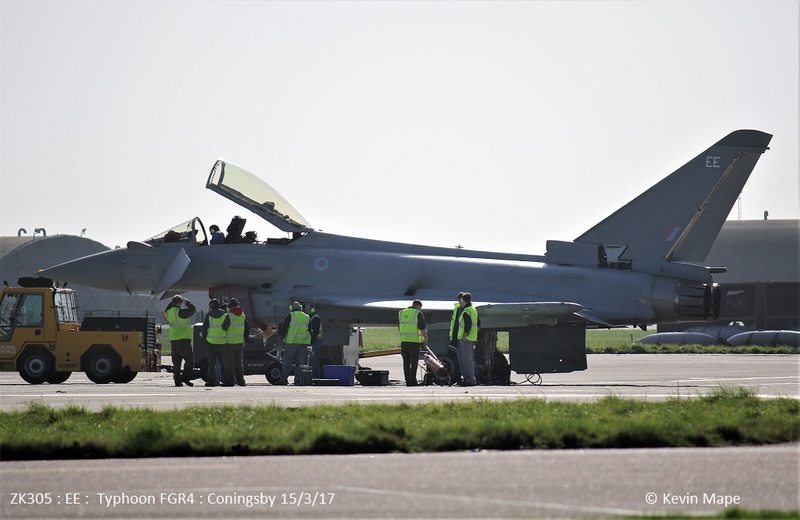 ZJ942/DH – QRA radio check. ZF374/374/1FTS/Tucano T1 c/s “LOP 45” – Parked on Sierra. ZF264/264/1FTS/Tucano T1 c/s “LOP 20” – Parked on Sierra. 08-0050/7SOS/CV-22B Osprey c/s “Knife 71” – Overfly heading north. ZK379/EB-B/41(R)TES – Noted on the Wash pan. 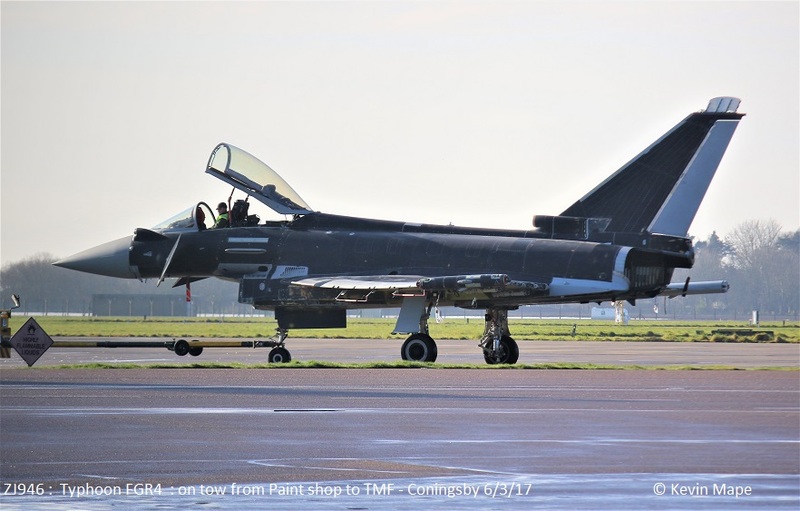 ZF374/374/1FTS/Tucano T1 c/s “LOP 45” – Departed. 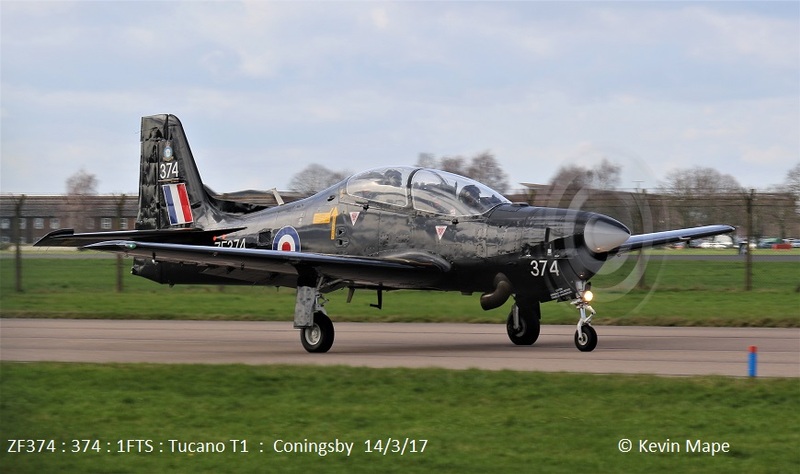 ZF264/264/1FTS/Tucano T1 c/s “LOP 20” – Departed. 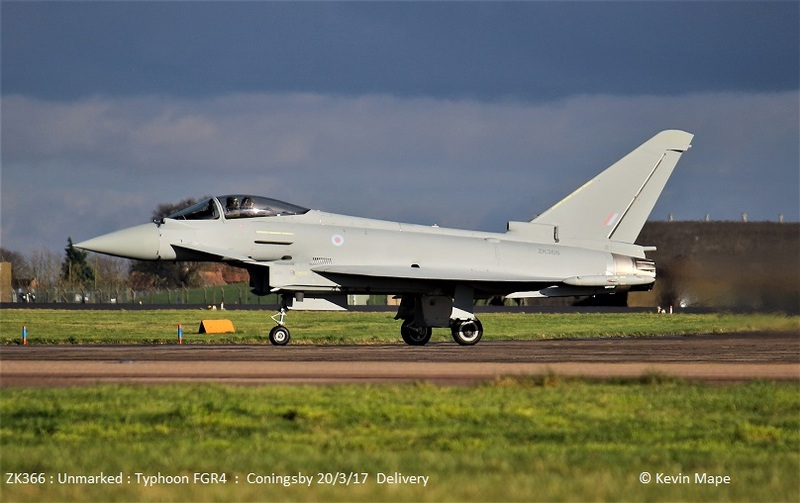 ZK376/Unmarked c/s “Tarnish 69” – Delivery from Warton. (TMF) ZK368/368, ZK315/41 100 year sp. 15th Wed Log thanks to Steve,Val & Garf. G-MAJT/JT/Eastern/Jetstream 41 c/s “East flt 101” in “102” out. 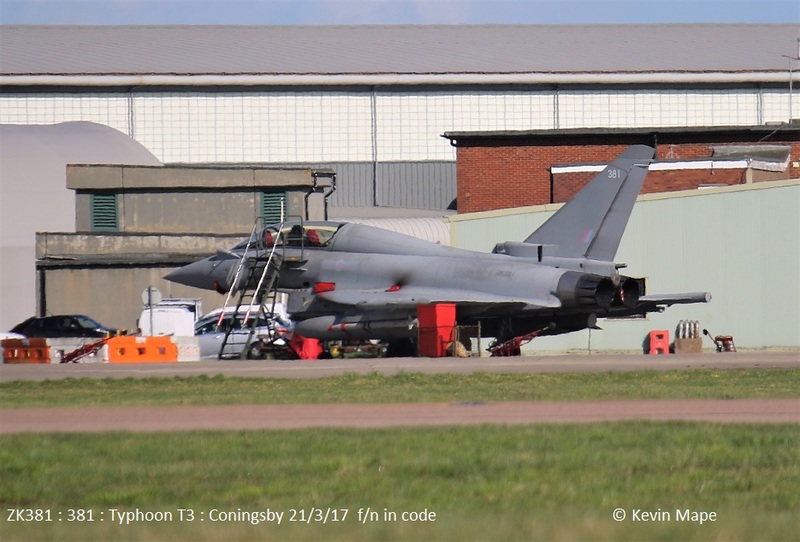 ZJ923/Unmarked – towed from HAS5 to Echo flight line. ZK305/EE code only – Towed from TMF to the ASP – Engine runs. 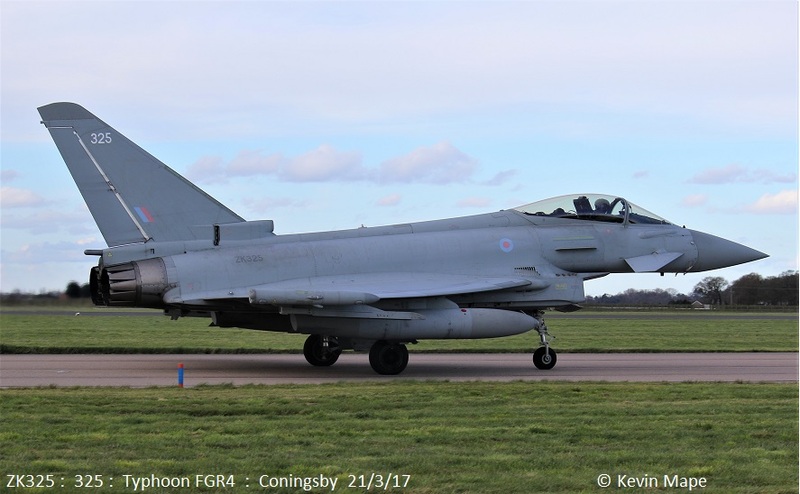 ZJ942/DH/XI(F)Sqn c/s “Kilo 5 Yankee 36” – QRA practice. ZA677/Chinook HC4 c/s “Vortex 590” – Overfly north to south. ZD575/Chinook HC4 c/s “Ultra 71”- Overfly north to south. ZK368/368 code only c/s “Lossie 37” – Delivery to Lossiemouth. G-MAJT/JT/Eastern/Jetstream 41 c/s “East flt 105” in “106” out. 16th Thur Log thanks to Steve,Val & Garf. ZK354/BY code only – noted on the Wash pan. 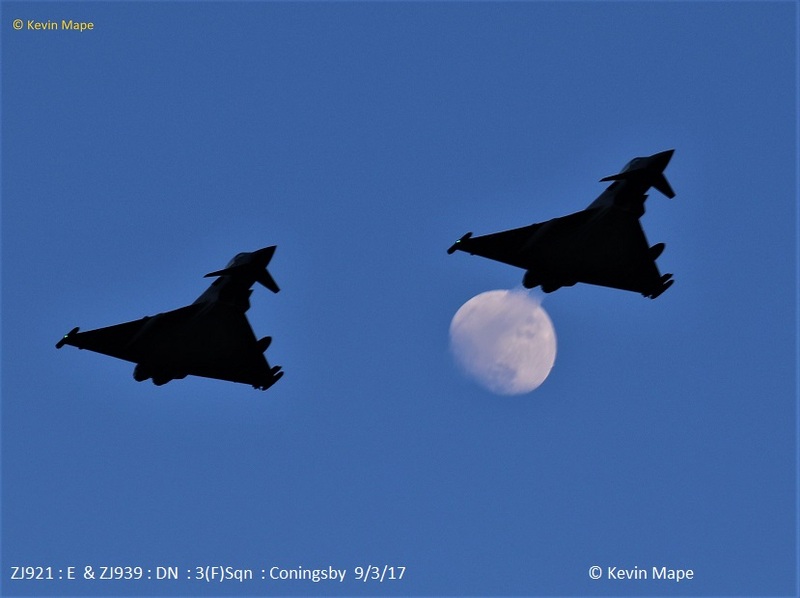 XX323/RAFAT/Hawk T1 c/s “Cranwell 04” – Overshoot. 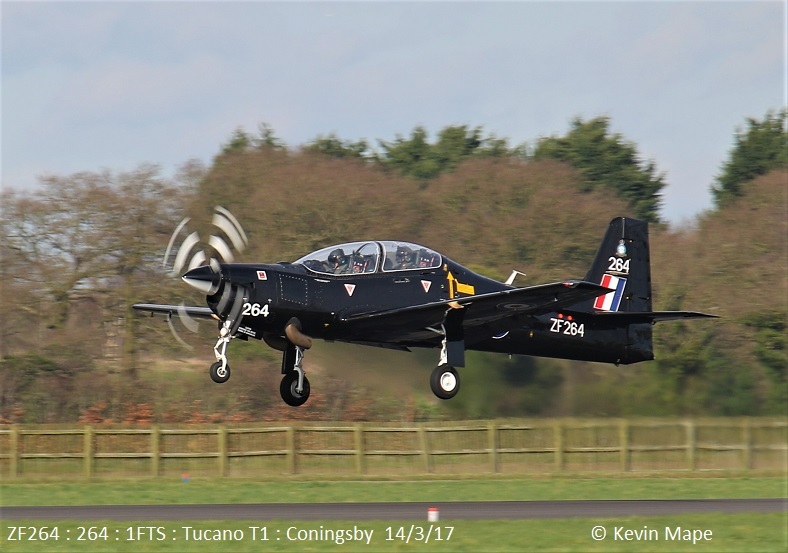 ZF264/264/1FTS/Tucano T1 c/s “LOP 48” – Overfly South to North. ZK310/Unmarked – Engine run – f/n Uncoded ex FL . PZ865/EG-S/BBMF/Hurricane IIc – Towed Southside for Compass swing. 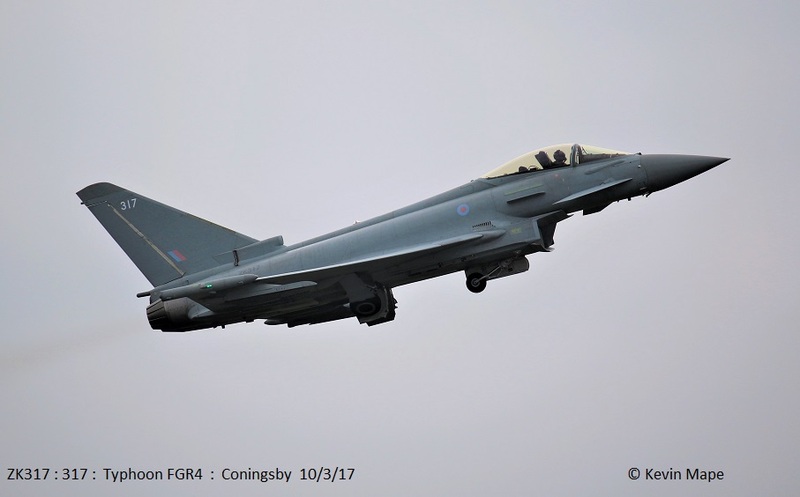 ZJ914/DZ/XI(F)Sqn – Noted on the Wash pan. 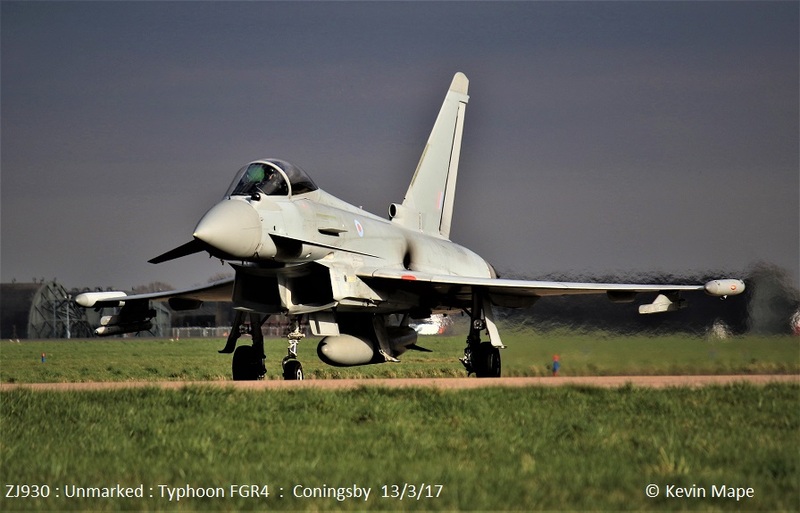 ZK354/BY code only c/s “Typhoon 29” – To Leeming. ZK330/330 code only – Engine runs outside HAS 10. 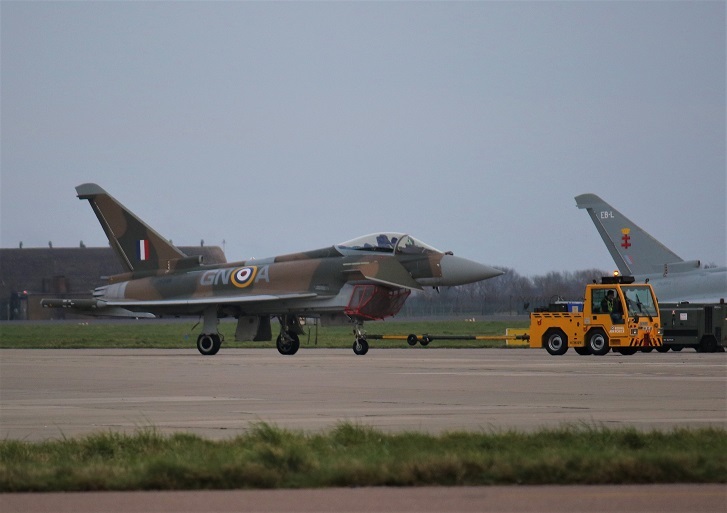 ZJ914/DZ/XI(F)Sqn – Towed back to Foxtrot. G-MAJT/JT/Eastern/Jetstream 41 c/s “East flt 103” in “104” out. G-BZLV/RAF Waddington Aero club/Cessna – Overshoot. ZK302/EC code only – APU runs in the tunnel outside TMF. 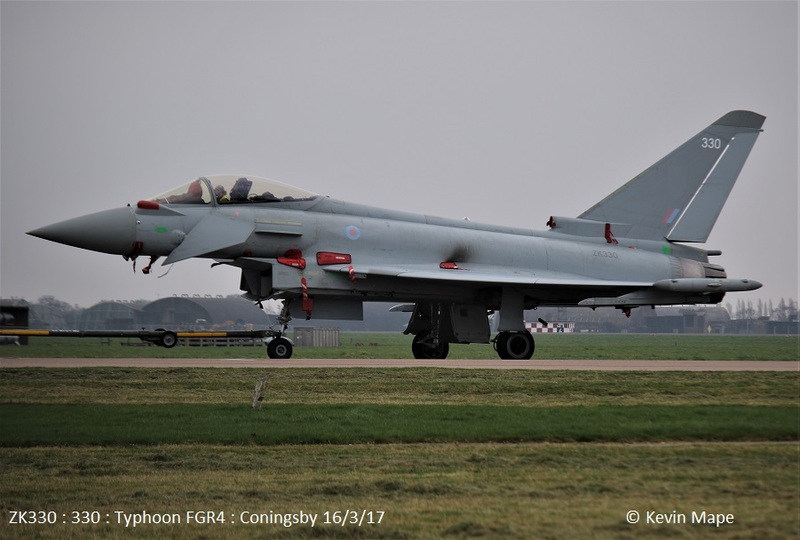 ZK354/BY code only c/s “Typhoon 29” – From Leeming after weekend stop. 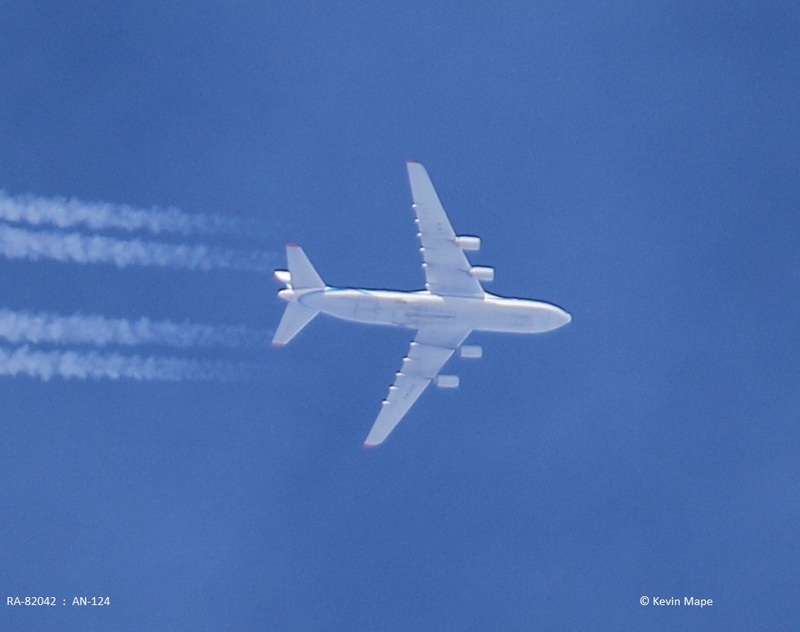 RA-82042/ An – 124 – c/s VDA6548″ – Overfly West to East. ZK366/Unmarked c/s “Tarnish 29” – Delivery from Warton. 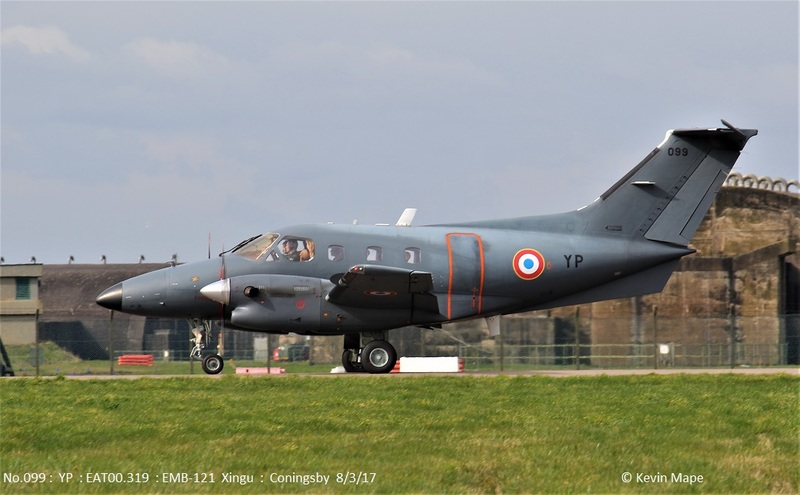 ZA947/UK/Dakota III – Engine runs. ZK313/W code only c/s “Nightmare 23” – Returned with a problem. ZK340/340 code only – Noted on the Wash pan. ZK381/381 code only – f/n in new code. ZK458/D/45(R)Sqn/King Air B200 c/s “Cranwell 70” – Overshoots. ZZ410/Wildcat AH1 c/s “Marine 13” – Fuel stop – Parked on Sierra. 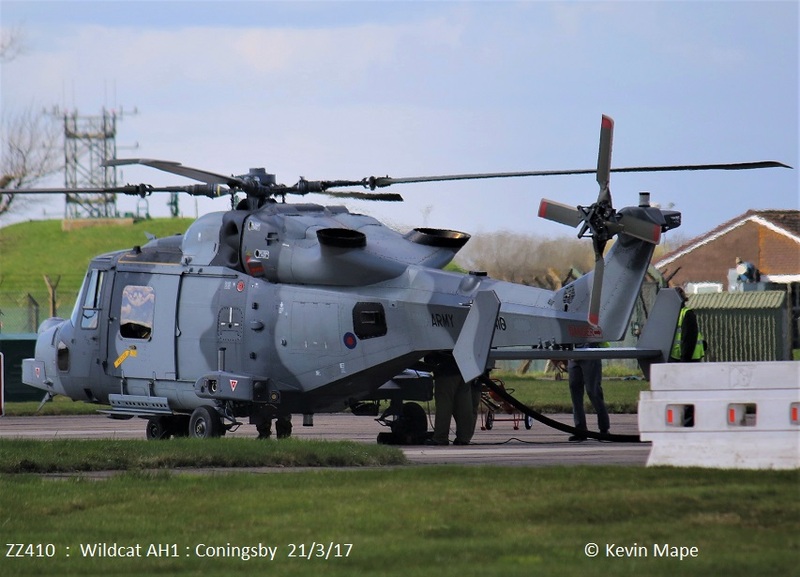 ZZ410/Wildcat AH1 c/s “Marine 13” – Departed. 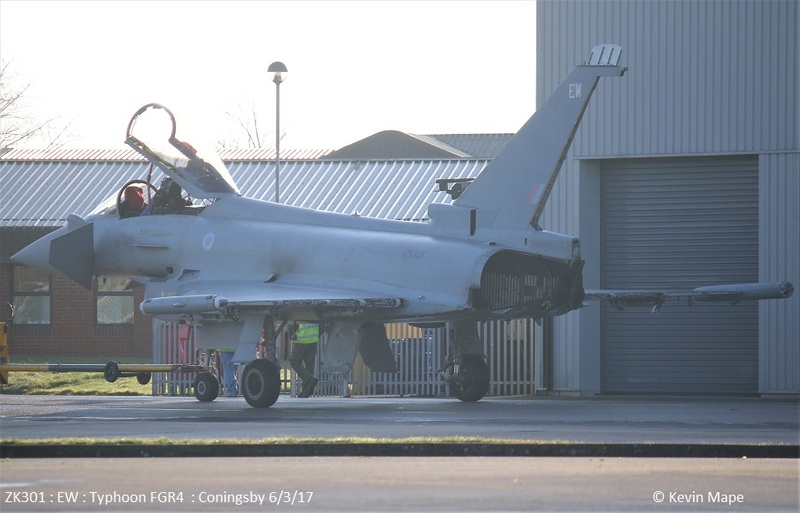 ZJ810/BI/29(R)Sqn – Towed into Paint shop. ZK373/Unmarked – Towed into Paint shop. XX189/CR/100Sqn/Hawk T1 c/s “Savage 2” – Parked on Sierra. After Dark -Log thanks to Steve,Val & Susie. XX348/348/208Sqn marks/ Hawk T1A c/s “Savage 1” – Parked on Sierra. 22nd Wed Log thanks to Steve,Val & Garf. ZK330/330 – Towed from Echo to Hangar 2. ZK340/340 – Toed from the Northside to Echo. XX348/348/208(R)Sqn marks/Hawk T1A c/s “Pirate 21” – Mission. & returned. “Triplex 12” – Ground abort. 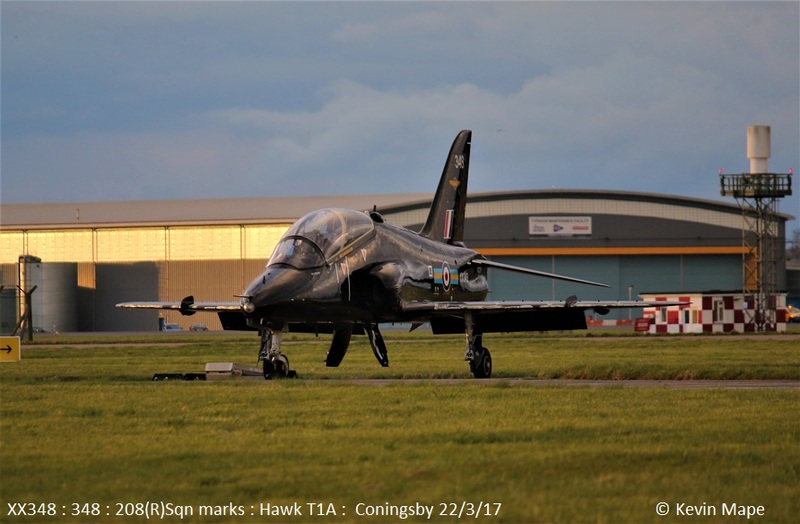 XX189/CR/100Sqn/Hawk T1 c/s “Pirate 19” – Mission. – did not return. 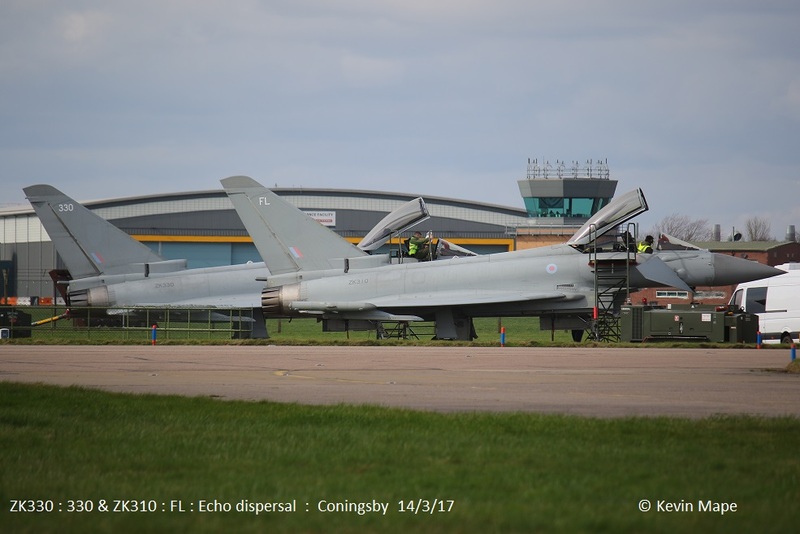 ZK330/330 code only – Towed back to Echo. ZK335/EB-G/41(R)TES c/s “Apollo 14” – Returned from a night stop. 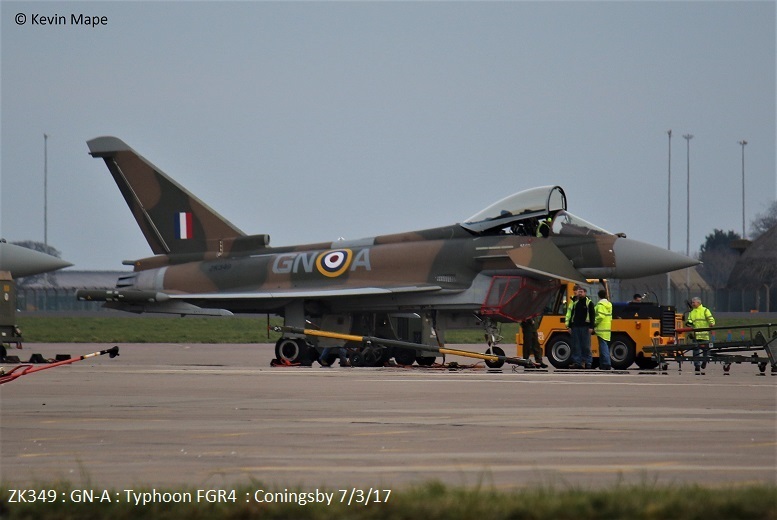 ZJ810/810/29(R)Sqn – Towed from the Paint shop – f/n in new code. 23rd Thur Log thanks to Steve,Val & Garf. ZJ921/R code only – Noted on the Wash pan. 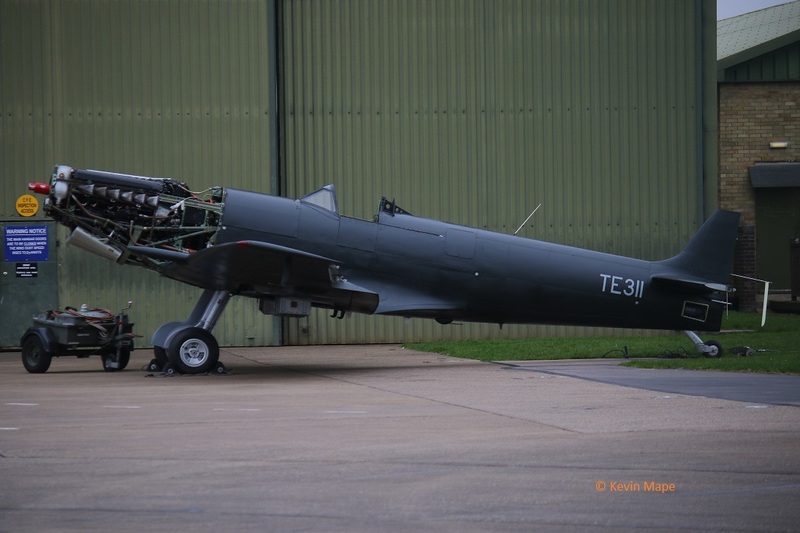 TE311/BBMF/Spitfire LF XVIe – All black – Unmarked. 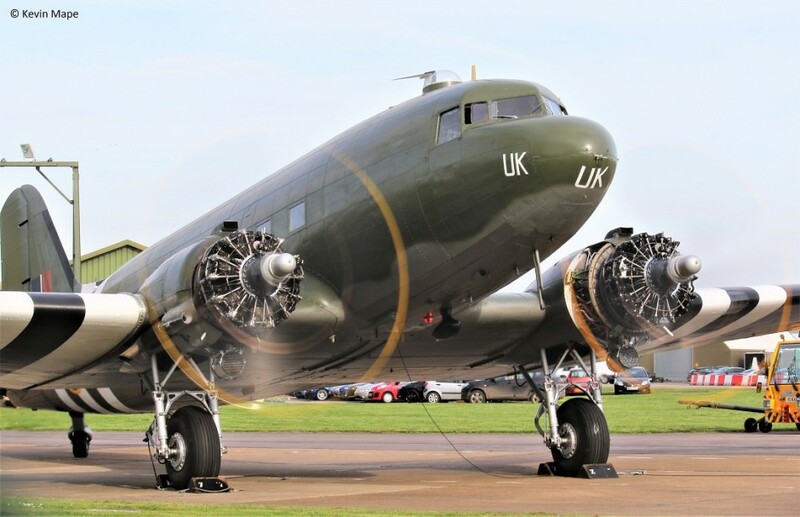 – Towed to BBMF. ZK315/41 100 year special – Towed from TMF to APU Tunnel. 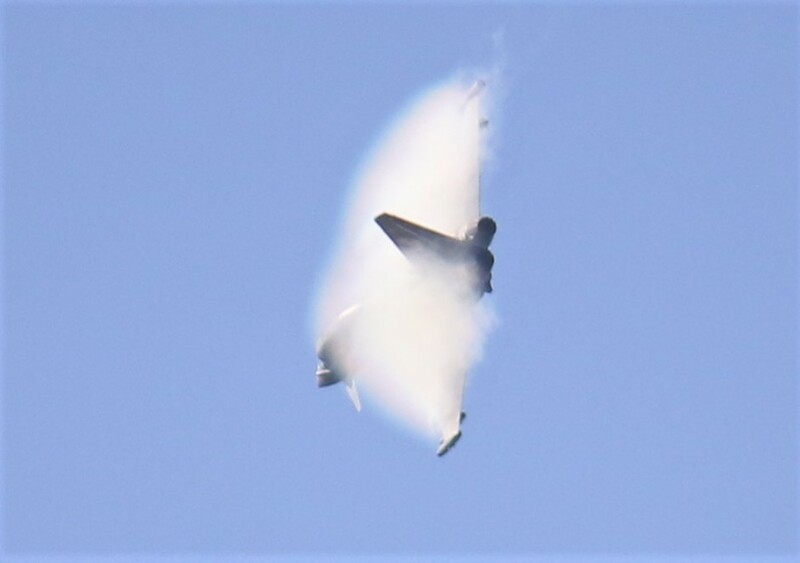 ZK379/EB-B/41(R)TES c/s “Rebel 58” – Ground abort. ZK305/EE code onlt – Noted outside TMF. ZK373/373 – Noted on the ASP – f/n with tail code. 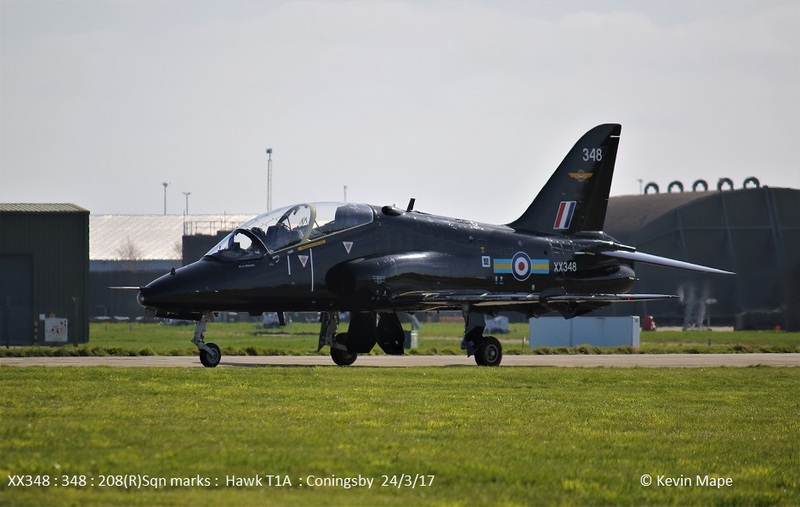 XX348/348/208(R)Sqn marks/Hawk T1A c/s “Pirate 10” – Mission. 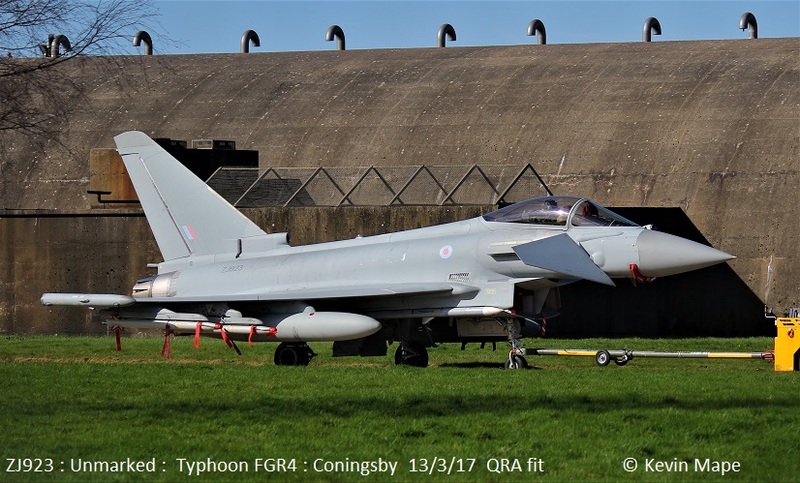 ZJ929/DL /XI(F)Sqn – QRA Radio check. ZK329/FH/1(F)Sqn – Towed from the TMF to the ASP – Engine runs then back to the TMF. ZK328/EB/6Sqn – Towed from TMF to Hangar 2. ZK380/T/II(AC)Sqn – Towed from Hangar 2 to the ASP – engine runs. ZK460/U/45(R)Sqn 100 year special/King Air B200GT c/s “Cranwell 78” – Overshoots. ZJ928/FQ/1(F)Sqn Towed from Echo to HAS 61. 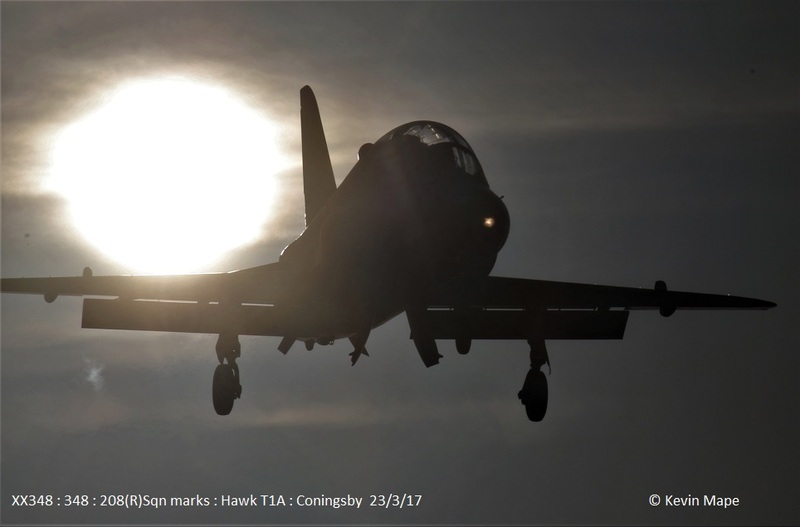 XX332/CD/100Sqn/Hawk T1A c/s “Pirate 28” – Low approach then departed. ZJ930/Unmarked Towed into the Paint shop. – Towed out later coded 930. 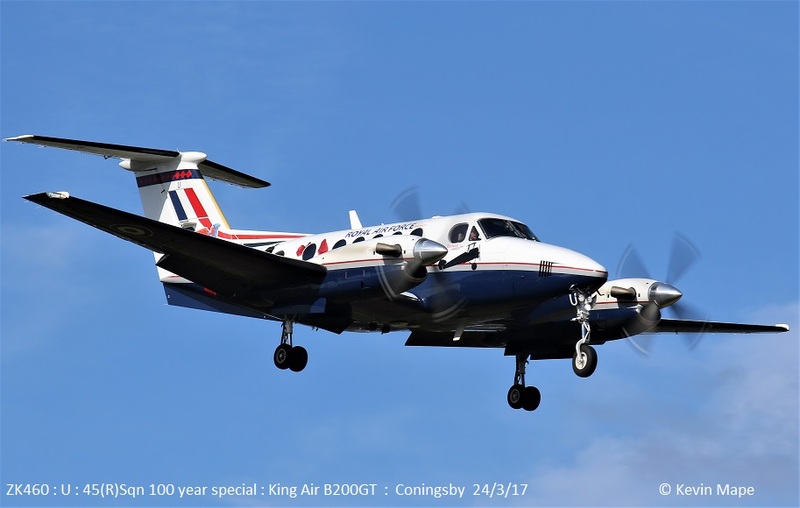 ZK460/U/45(R)Sqn 100 year special/King Air B200GT c/s “Cranwell 70” – Overshoots. 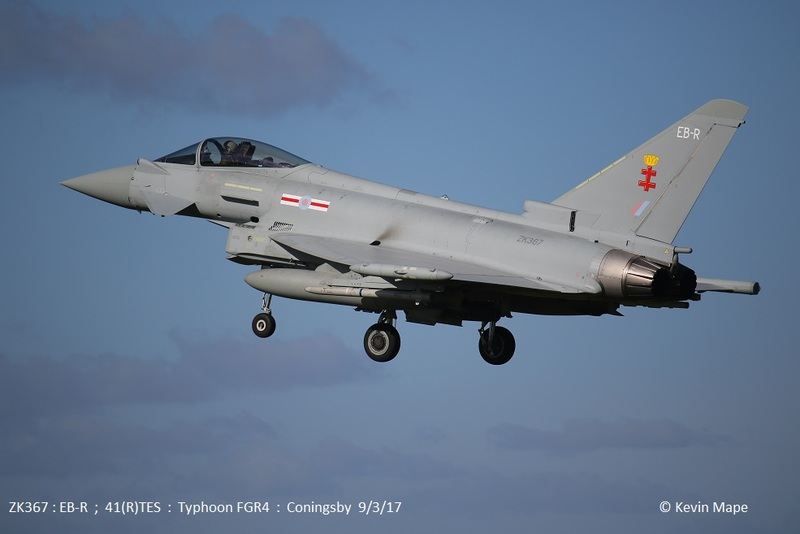 ZK330/330 code only c/s “Typhoon 83” – Test flight. XX348/348/208(R)Sqn marks /Hawk T1A c/s “Pirate 25” – To Sierra. ZJ927/Unmarked Towed into the Paint shop. ZK313/W code only – Noted on the Wash pan. XX348/348/208(R)Sqn marks/Hawk T1A – Noted on Sierra. 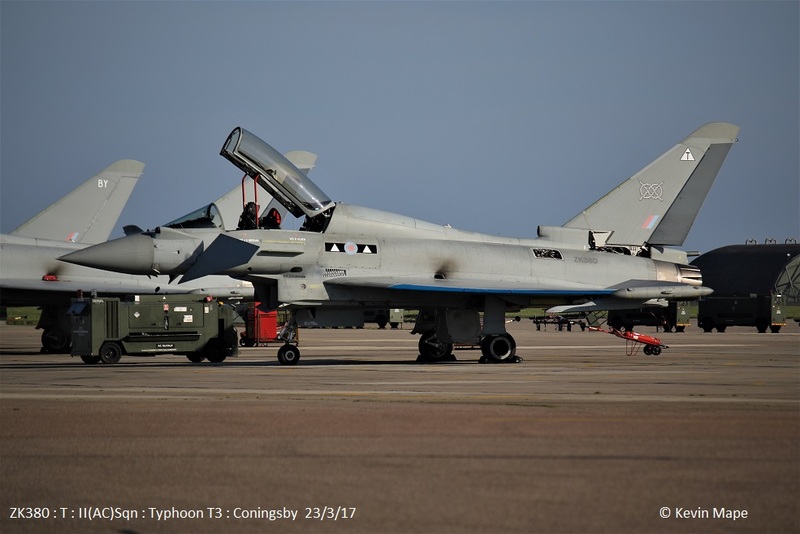 ZJ800/BC/29(R)Sqn c/s “Typhoon 25” – Display. XX348/348/208(R)Sqn marks /Hawk T1A c/s “Pirate 25” – Departed. ZK460/U/45(R)Sqn 100 year special/King Air B200GT c/s “Cranwell 75” – Overshoots. 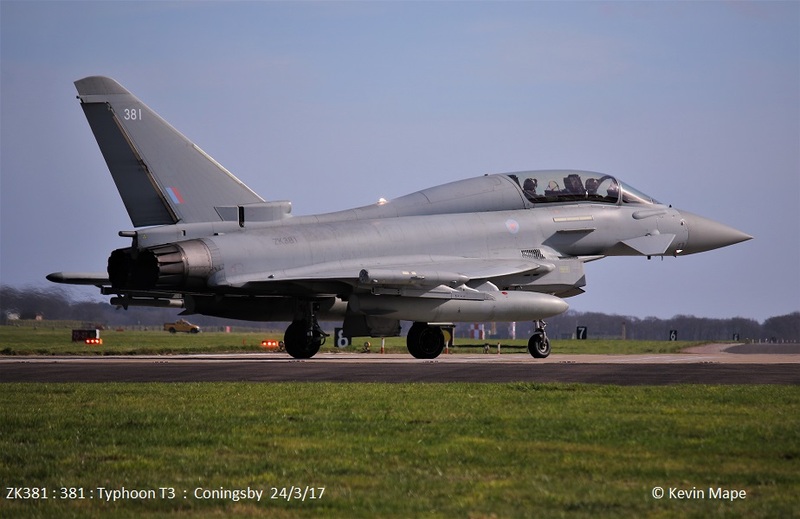 ZJ234/S/60(R)Sqn/Griffen HT1 c/s “Shawbury 94” – To Shawbury. ZK459/X/45(R)Sqn 100 year special/King Air B200GT c/s “Cranwell 67” – Parked on the ASP. PZ865/EG-S/BBMF/Hurricane IIc c/s “Hurricane 90” – Test flight. 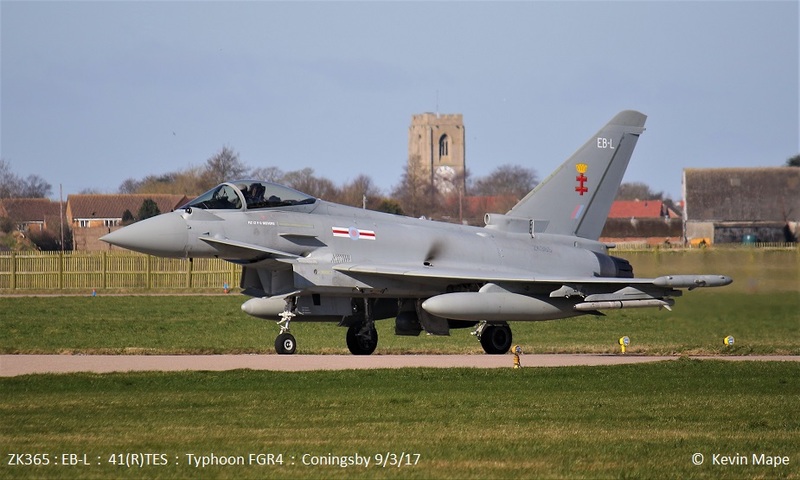 ZJ810/810/29(R)Sqn c/s “Typhoon 48” – To Leeming. ZK459/X/45(R)Sqn 100 year special/King Air B200GT c/s “Cranwell 352” – Overshoots then landed – To Sierra. 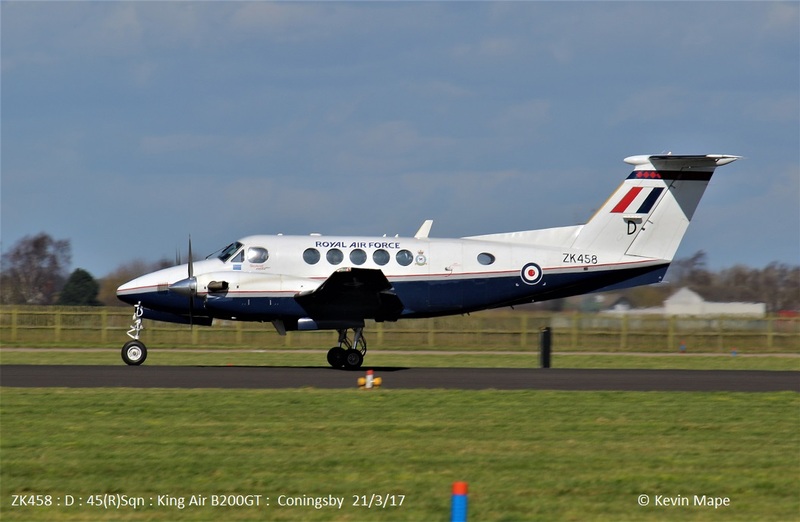 ZK459/X/45(R)Sqn 100 year special/King Air B200GT c/s “Cranwell 352” – Departed. 27th Mon Log thanks to Susie,Mark & Rick. ZJ920/920 code only c/s “Rampage 42” – f/n with new code. ZK331/BT /29(R)Sqn – Noted on the Wash pan. 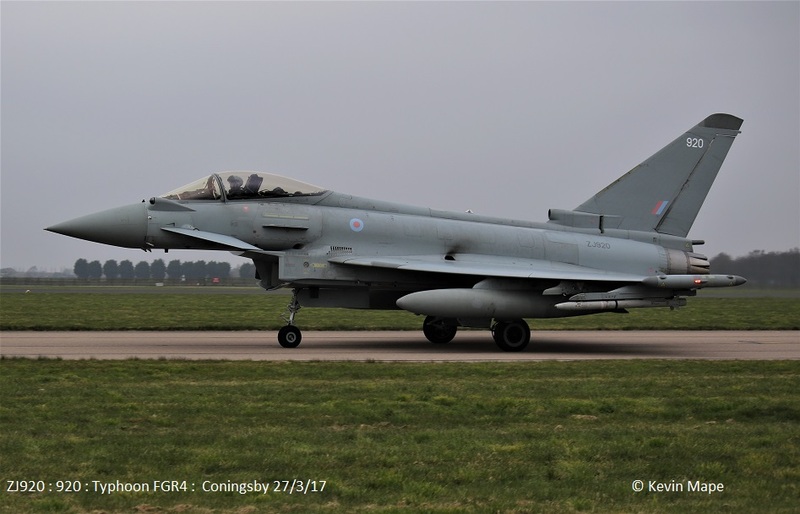 ZK315 /41Sqn 100 special – Noted outside TMF. ZK305/EE code only – Noted outside TMF. 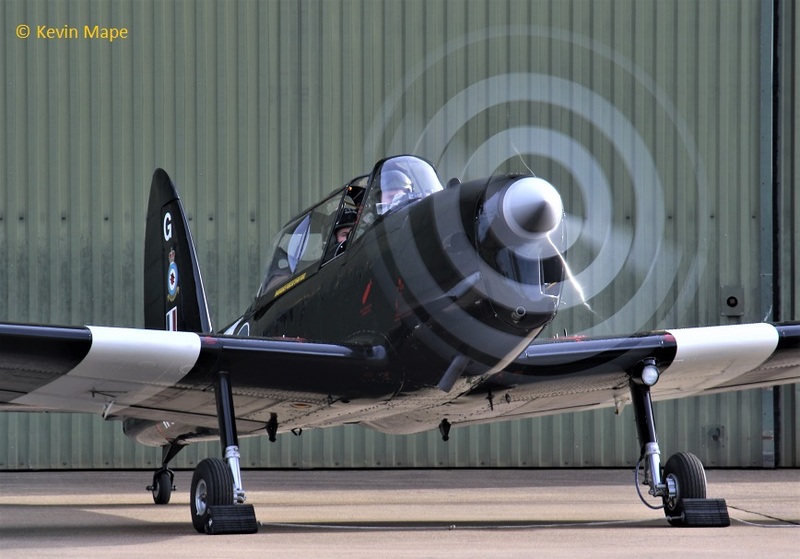 WK528/C/BBMF/Chipmunk T10 – Engine run. 28th Tue Log thanks to Steve & Val . 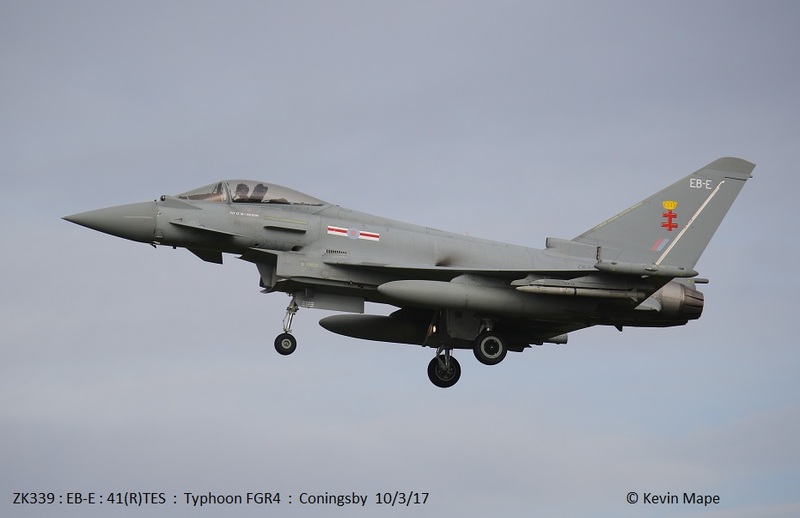 ZK329/FH/1(F)Sqn – Noted outside TMF. 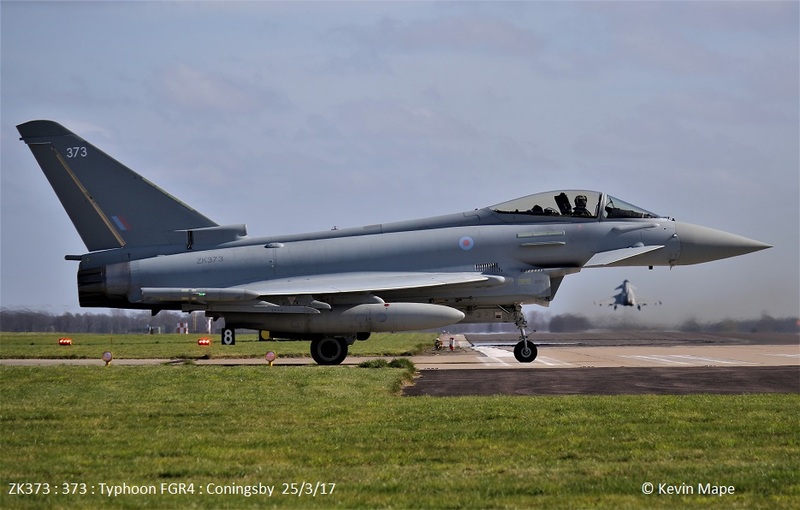 ZK331/BT/29(R)Sqn – Noted outside TMF. 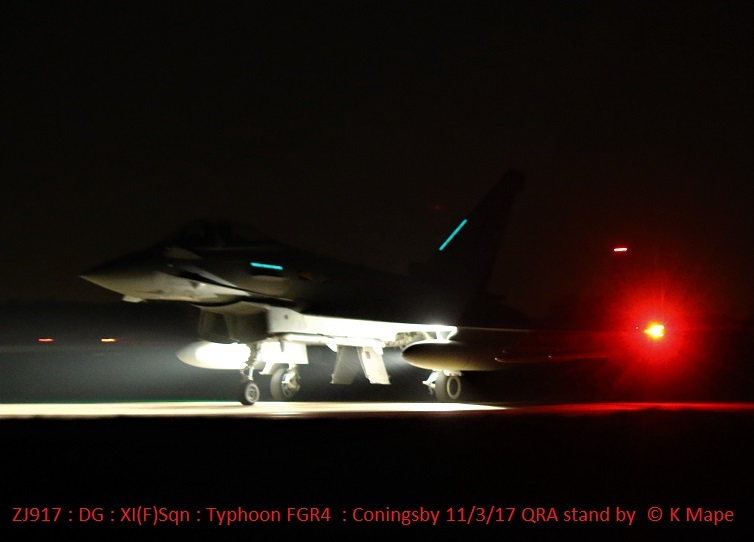 ZJ942/DH/XI(F)Sqn – QRA radio check. 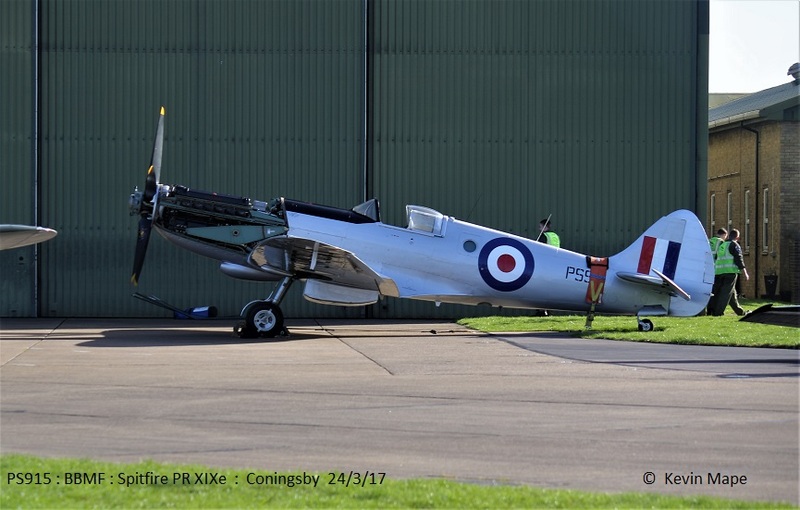 PS915/BBMF/Spitfire PR XIXe – Noted outside BBMF. 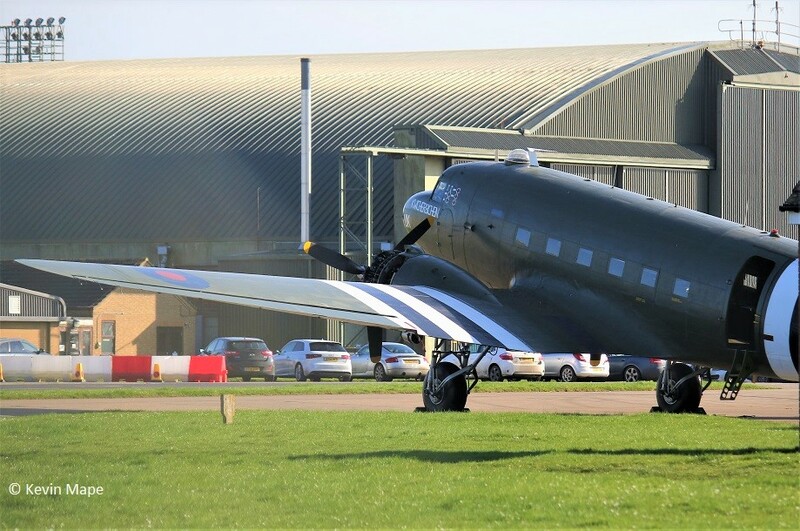 WG486/G/BBMF/Chipmunk T10 – Parked outside BBMF. No.090/ZF/EAT00.319/Xingu c/s “Cotam 1724” – Parked on Sierra. No.090/ZF/EAT00.319/Xingu c/s “Cotam 1724” – Departed. ZK376/Unmarked – Towed from Hangar 2 to the ASP. PZ865/EG-S/BBMF/Hurricane IIc – Noted outside BBMF. 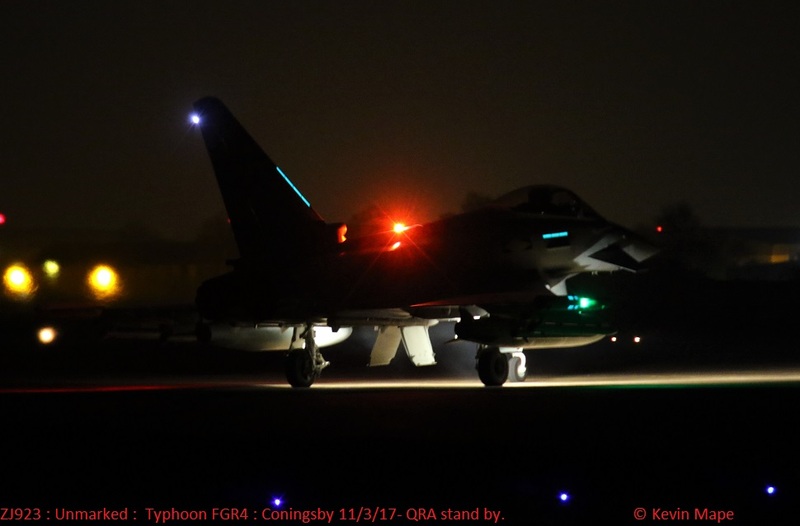 ZK383/FY code only c/s “Typhoon 25” Display – Aborted due to weather. 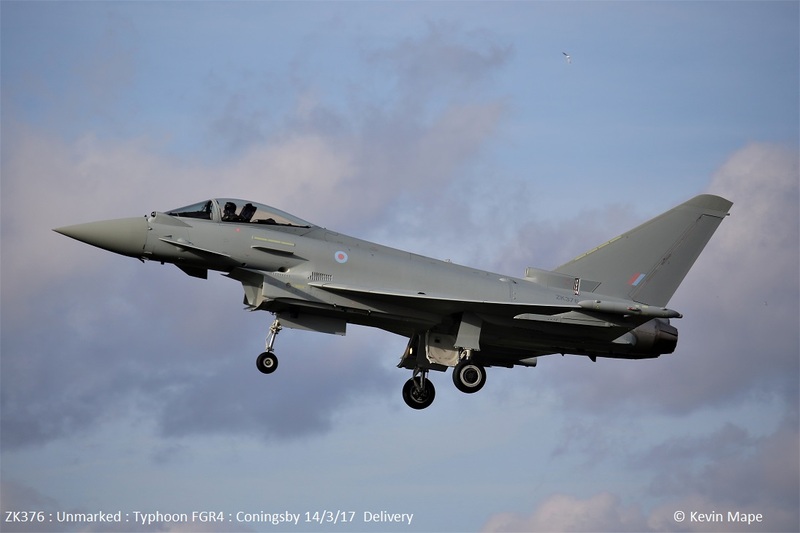 ZJ928/FQ/1(F)Sqn – Noted outside TMF. 29th Wed Log thanks to Susie. 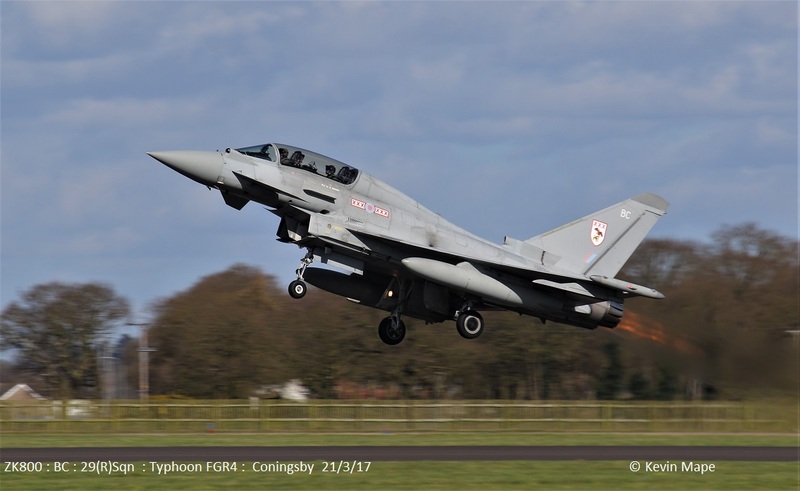 TMF – ZK315/41Sqn special – Engine runs. ZK305/EE code only – Towed from Foxtrot to North side. ZK335/EB-G/41(R)TES c/s “Apollo 12” – ground Abort. 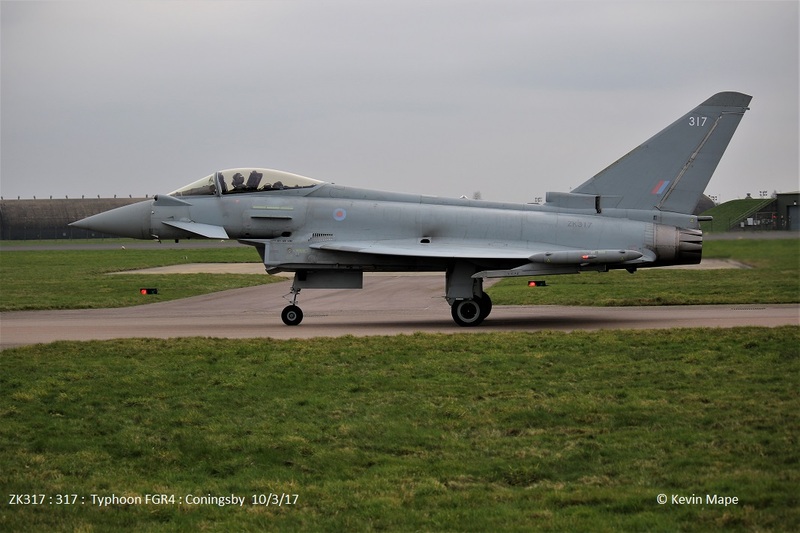 ZK354/BY code only c/s “Triplex 13” – Return from Leeming. 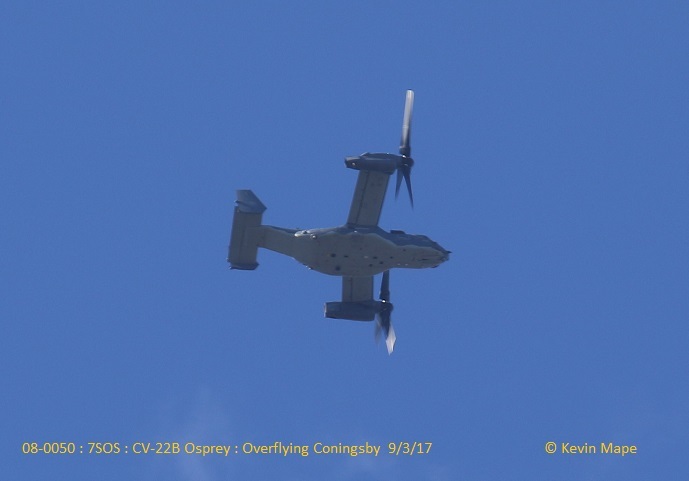 12-0063/7SOS/CV-22B Osprey c/s Knife 71 – overfly South to North. 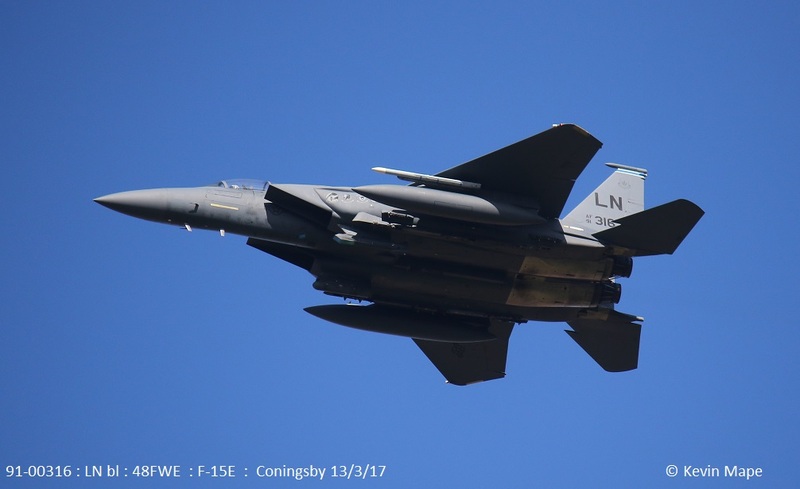 91-0604/LN rd /48FW/F15E c/s “Claw 41” – high overfly . G-HMDX/MD900/Magpas-Air ambulance c/s “*****” – refuelling stop on Sierra. 30th Thur Log thanks to Susie. 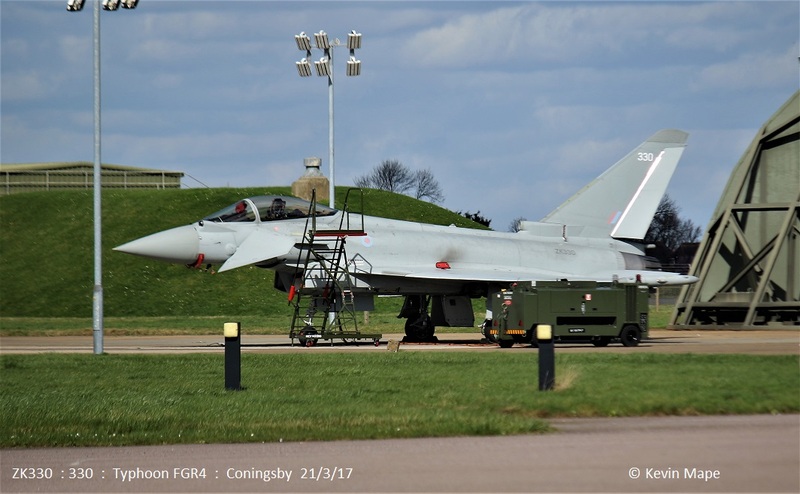 ZK329/FH/1(F)Sqn – Noted on tow from TMF to the old paint shop . G-MAJJ/JJ/Eastern/Jetstream c/s East Flt 102 in, 103 out. 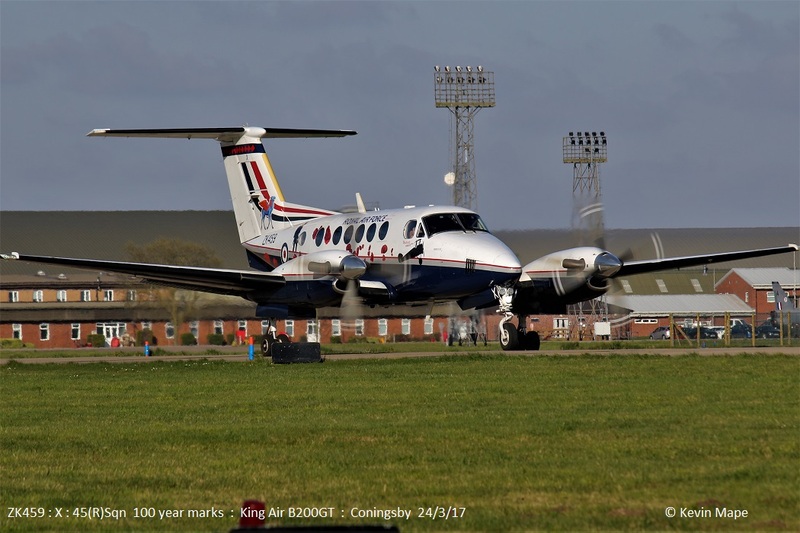 ZK458/D/King Air B200GT c/s “Cranwell 66” – Rollers. N0.090/ZF/EAT00.319/Xingu c/s “Cotam 1728” – Parked on Sierra. ZZ398/Wildcat AH1 c/s “Marine 13” – Fuel stop. ZF339/339/1FTS/Tucano T1 c/s “Cranwell 35” – Parked on Sierra. ZK325/325 code only c/s “Rampage 14” – RTB with issue. Formation of 4 Tucano T1’s c/s” Vanquish Flt” – High Overfly. ZF342,ZF139,ZF135 & ZF244. Vanquish 1 to 4. ZK332/EB-J code only c/s “Ascot 9542” – Arrived from Cyprus . 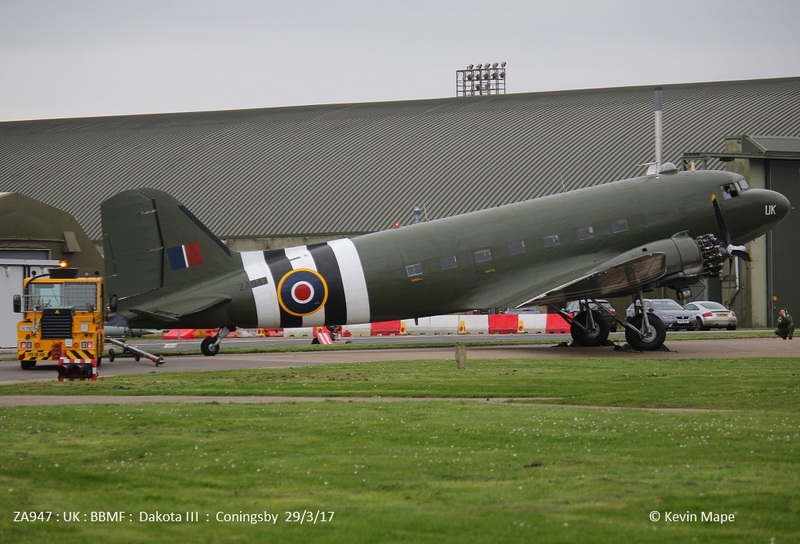 ZA947/UK/BBMF/Dakota III – Engine tests. ZK352/BV code only c/s “Typhoon 45” – 8-30am Display. 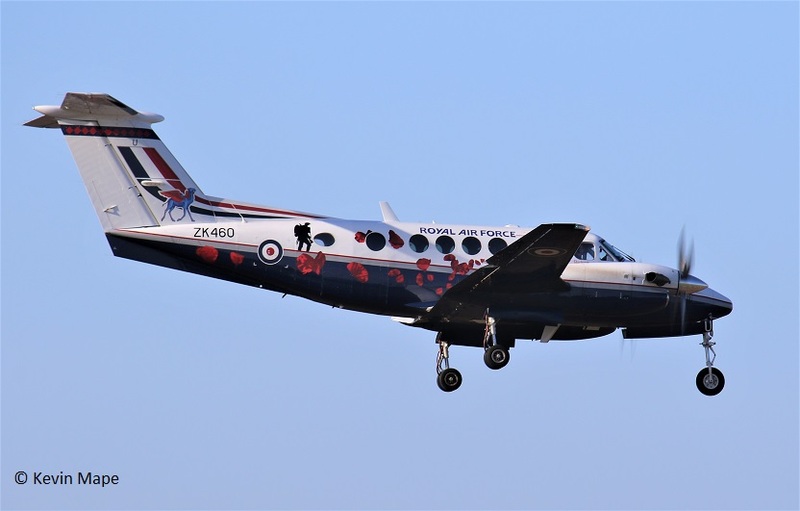 ZK459/X/ 45(R)Sqn Poppy special marks/ King Air B200GT c/s “Cranwell 76” – Overshoot. G-MAJJ/JJ/Eastern/Jetstream c/s “East Flt 103” in, “104” out. ZK345/EP code only c/s “Rafair 7001” – To Foxtrot. (TMF) – ZK315/41 100 year special. 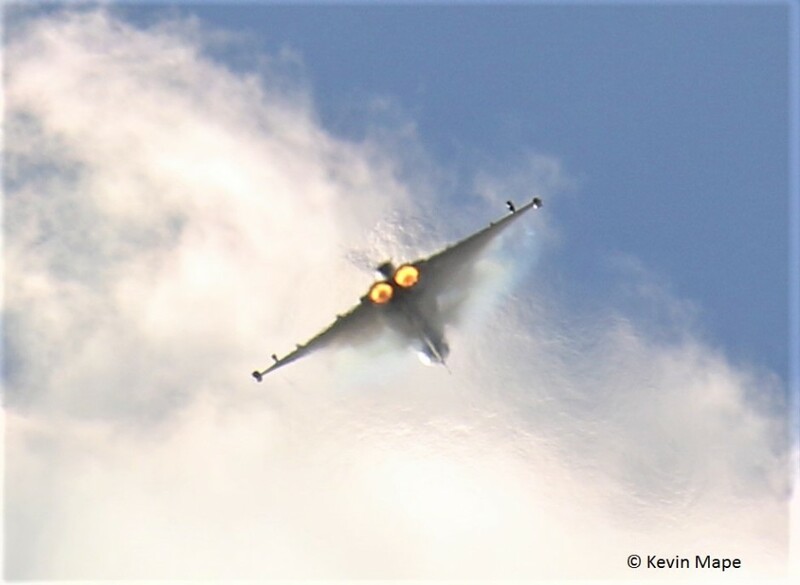 – Engine runs. ZJ942/DH Towed from HAS 1 to HAS 4. Spitfire LF IXe : MK356/5J-K.
ZK302 : EC : code only : Arrived 15/3/17 as “Lossie 37” – Noted in the APU tunnel 20/3/17. ZK305 : EE : code only : Arrived 21/3/16. – Noted on the Wash pan 14/3/17 & 15/3/17. 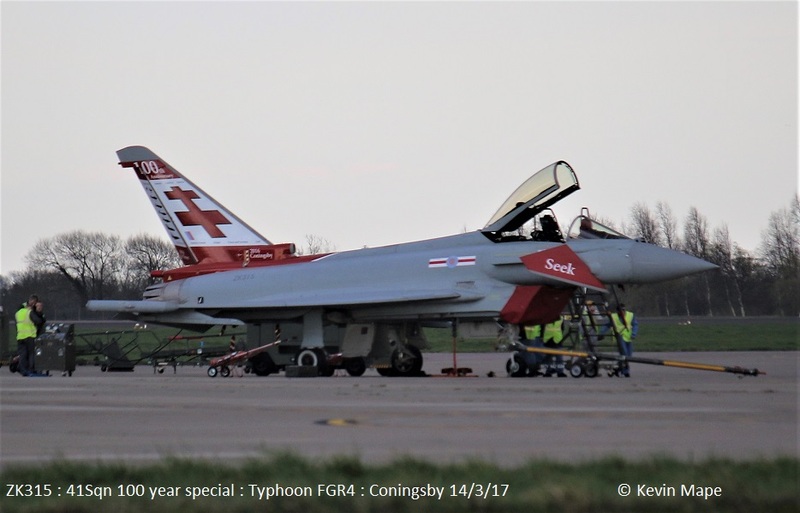 ZK329 : FH : 1(F)Sqn : Arrived 14/12/16 as “Lossie 45” – Noted on the ASP – Engine runs 23/3/17. 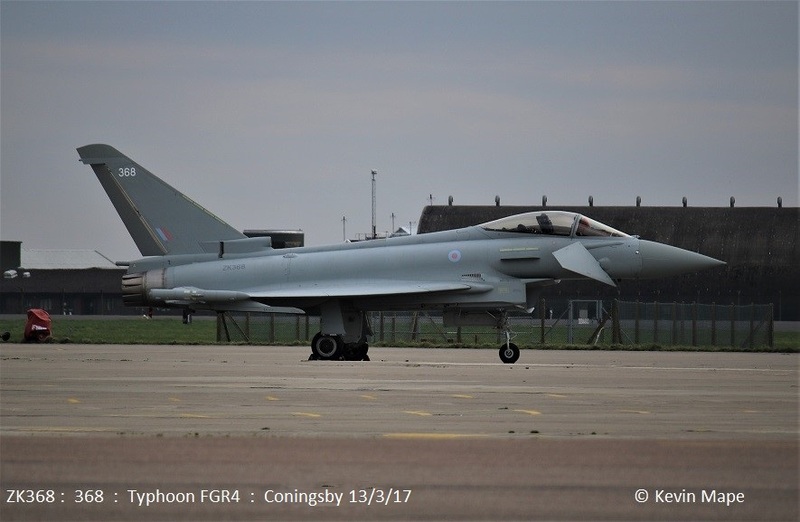 ZK340 : FI: code only : Arrived 22/9/16 – Towed out of the paint shop 13/2/17 as 340 code only.Flying with XI(F)Sqn 13/3/17 – To Cyprus 28/3/17. 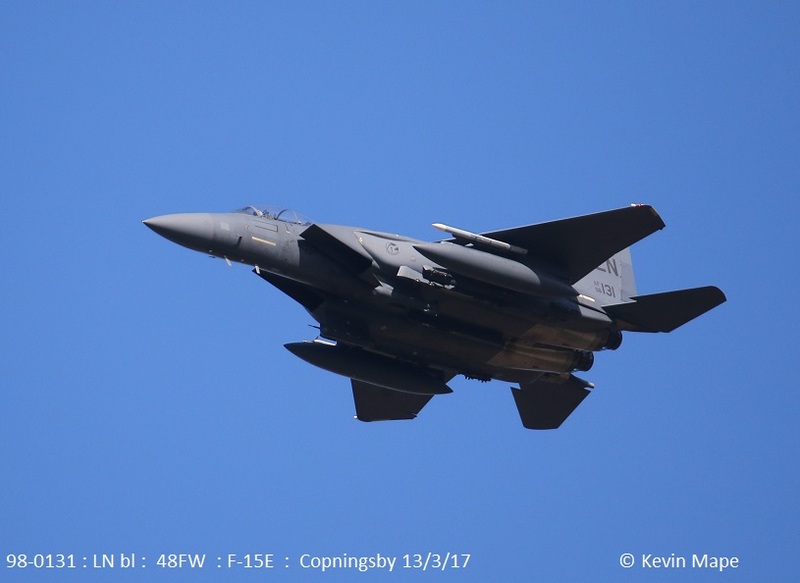 ZK349 : GN-A : BoB special : Noted on the ASP 7/3/17 Engine runs.